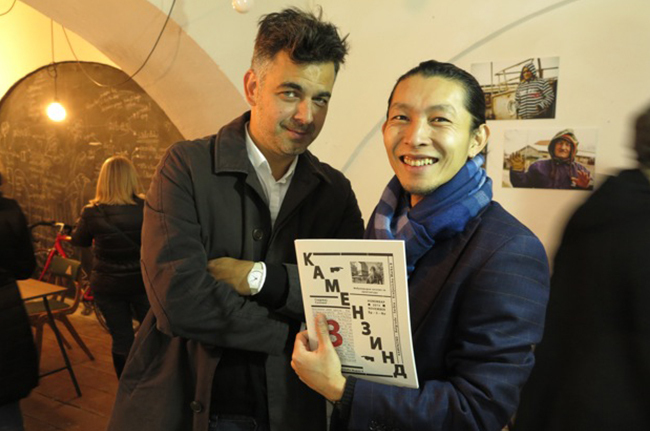 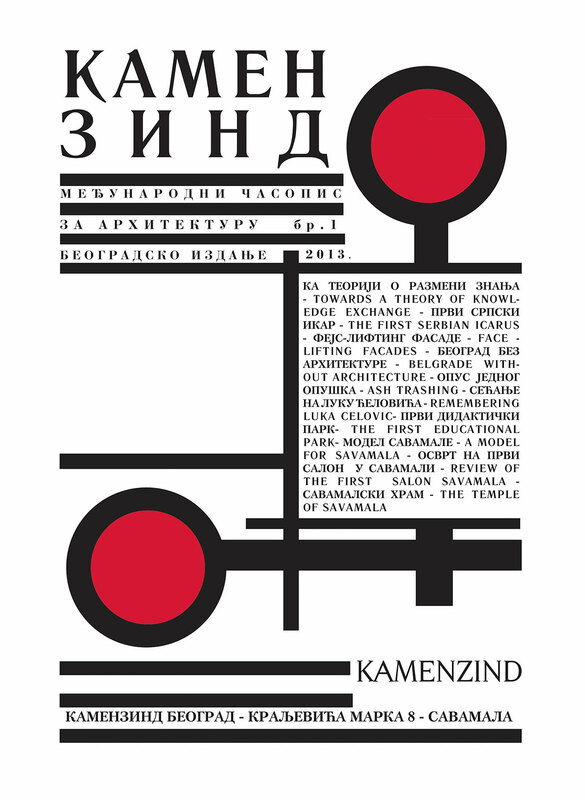 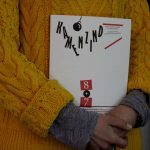 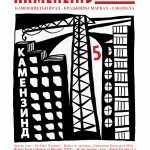 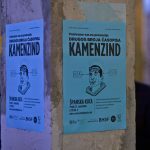 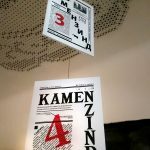 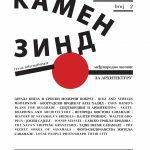 Kamenzind is a Belgrade based architectural magazine and research platform that deals with architecture and urbanism from the perspective not only of architects but also musicians, artists, physicists, civil engineers, art historians, economists and any other kind of inhabitant or user of architecture. 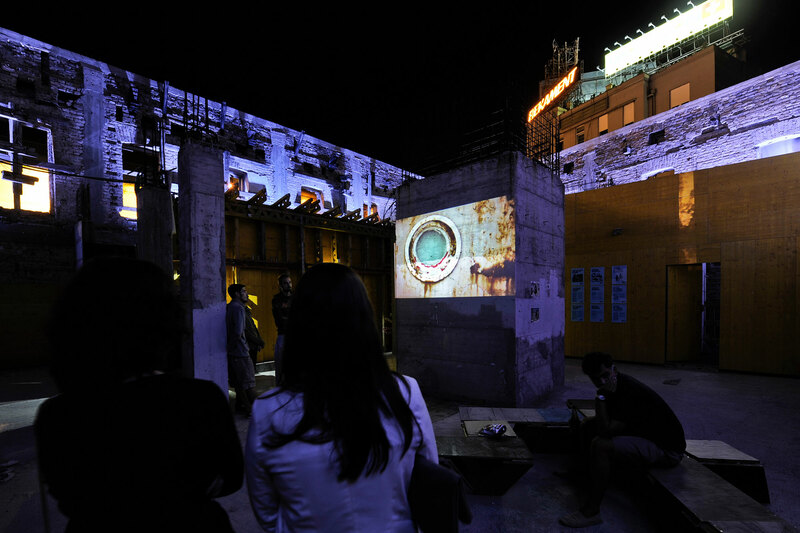 In its focus is the city, as a spatio-cultural phenomena. 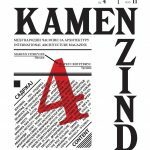 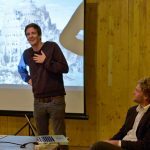 When we founded the architecture magazine Camenzind in 2005 as a non-profit association in Zurich, we felt that there was a gap in the debate about architecture. 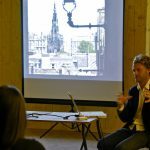 Everyday ‘users’ of buildings were not being represented by high-end architecture publications, which are largely produced for an exclusive readership. 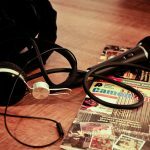 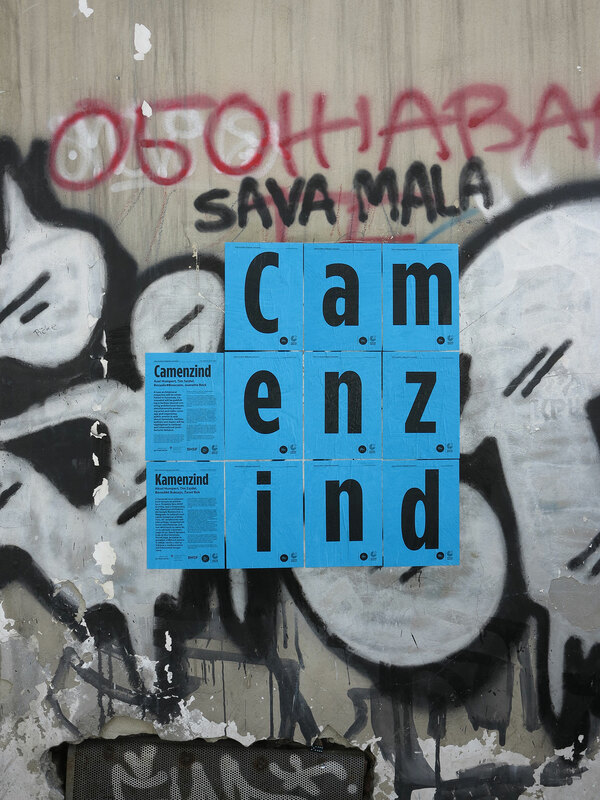 Camenzind sought to make the conversation more inclusive without compromising on the quality or relevance of its content. 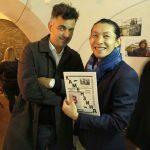 The magazine is therefore written by both architects and laymen, with the idea that anyone who inhabits the built environment has the right to an opinion. 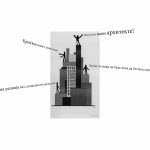 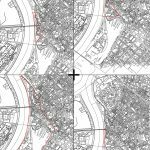 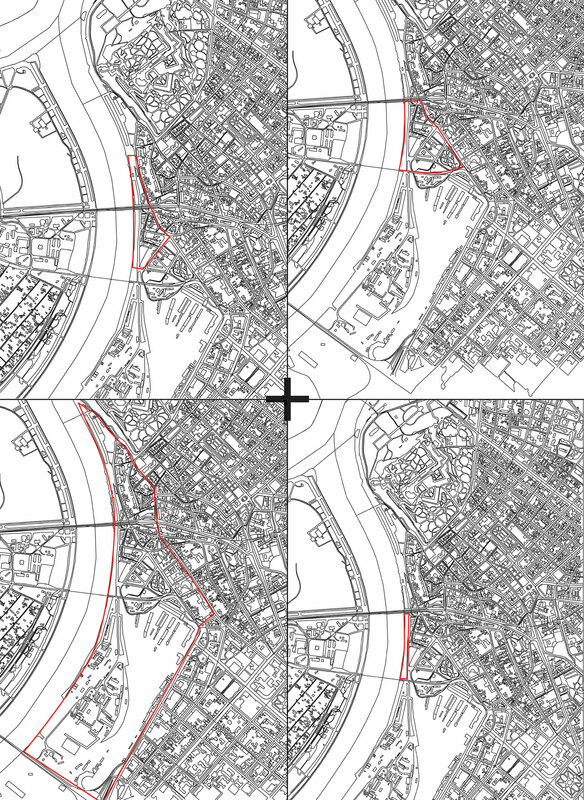 In the attempt to engage more people and extend the breadth of our work Camenzind morphed recently from just a publication into an architectural and urbanistic research platform that made other projects possible. 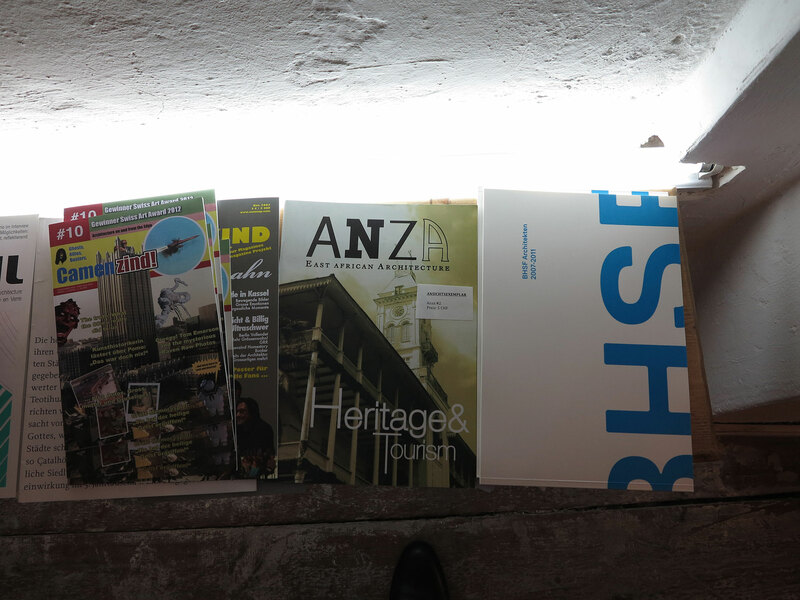 The first of these projects involved setting up the East African architecture magazine “Anza” in Dar Es Salaam in 2011. 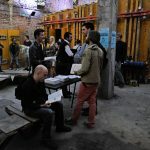 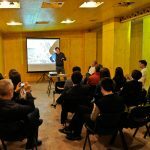 Based on the success of this project we were invited to Belgrade to take part in the Urban Incubator. 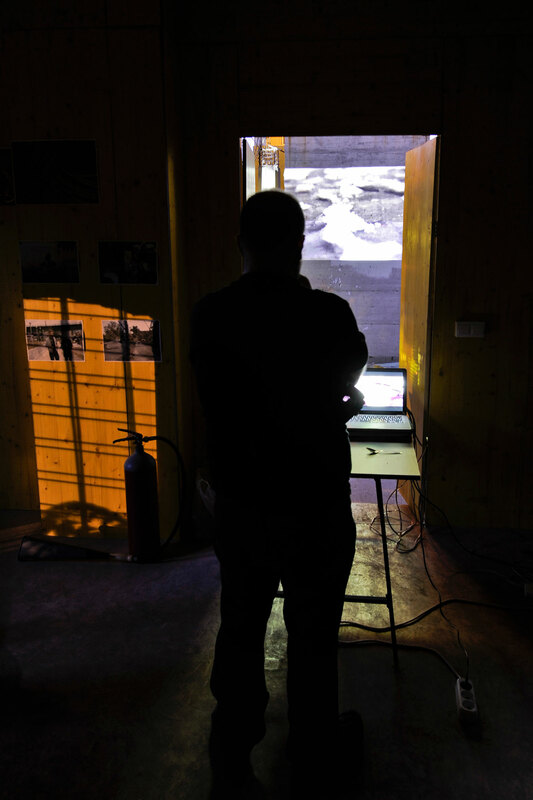 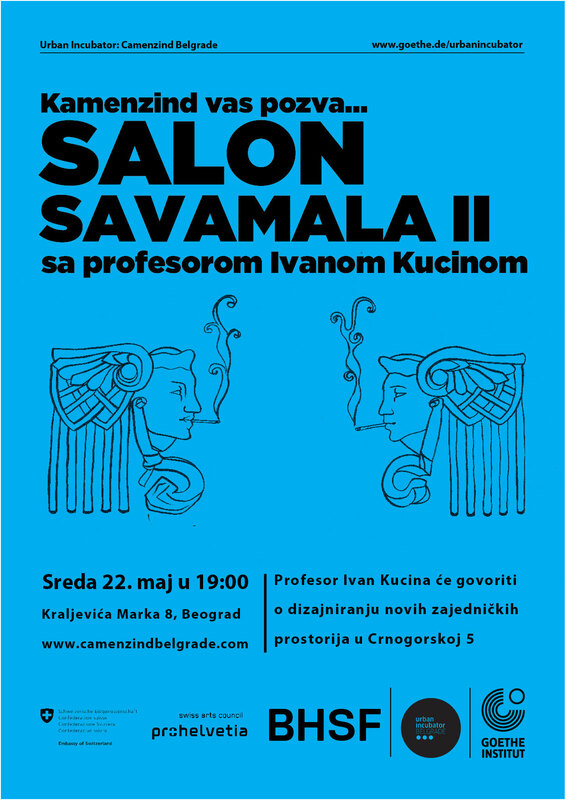 During our preparation numerous contacts put us in touch with Ivan Kucina, Professor of Architecture at the University of Belgrade, who was initially quite disdainful of our objectives, stating that we were not going to be present long enough to understand the complexity of the situation. 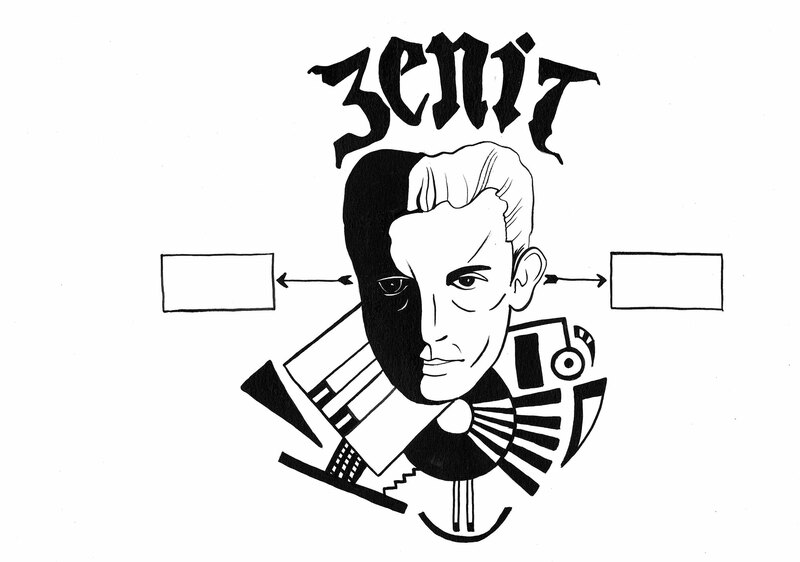 Our greatest fear at the outset was that he might be right. 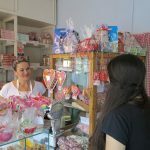 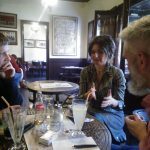 So we rented an apartment in New Belgrade, found ourselves a strong local partner – Ana Djordjevic-Pertrovic our Serbain editor – and stopped all other projects to focus on this one. 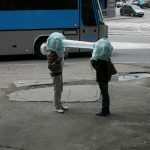 What we found was that the situation was just as disorientating and menacingly complex as Professor Kucina had warned. 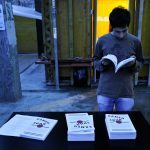 He later wrote an article for us, giving his take of this scenario: post-socialism gave way to turbo-capitalism, the result of which is that there is little or no culture of the communal, people’s trust has been broken too many times, they feel irrevocably betrayed by any government, the critical lack of any public funds has lead to endemic corruption and pervasive urban decay. 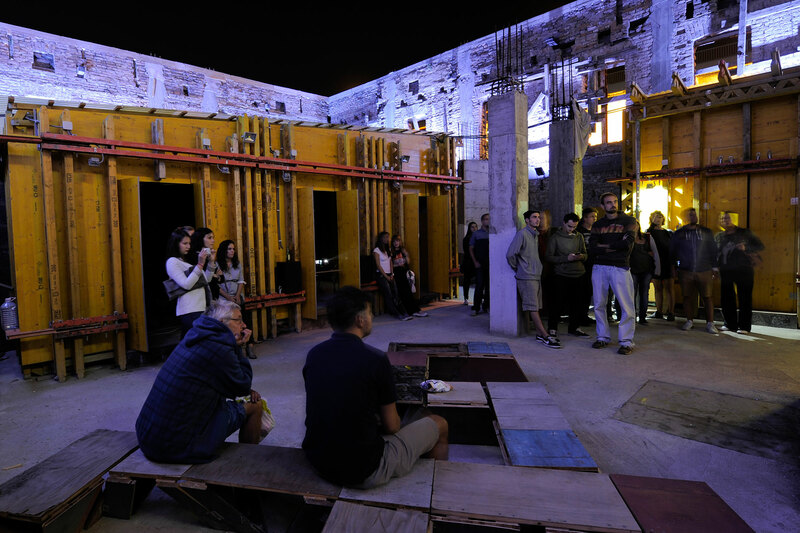 We found ourselves facing the difficult question: what happens when architecture stops working for the public, when people no longer feel that they have any control over their built environment? 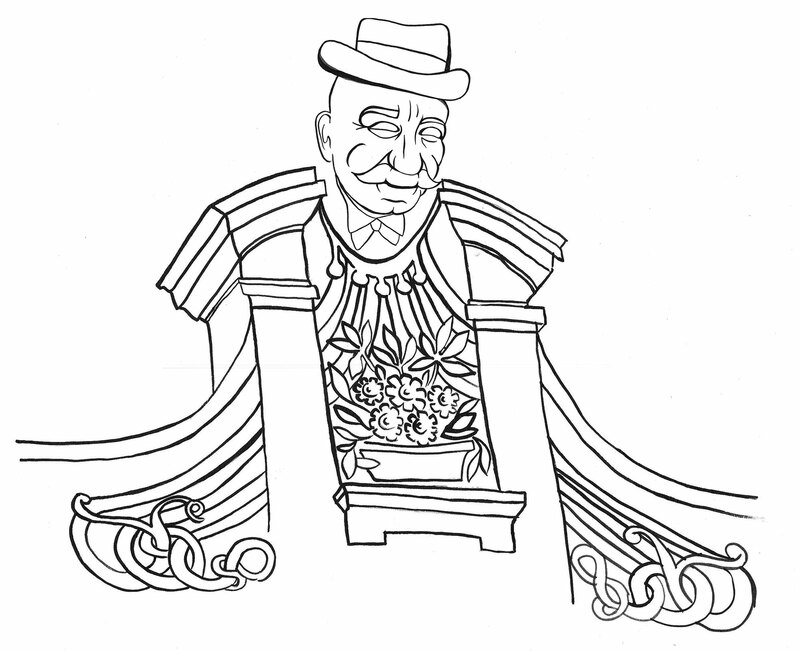 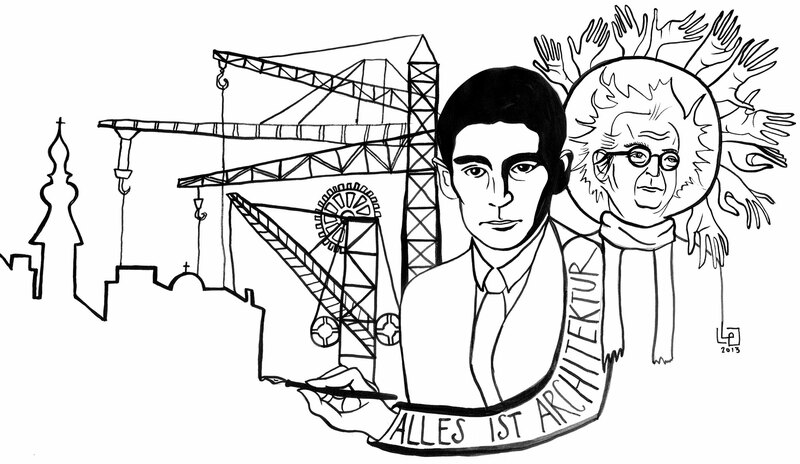 A loss of faith in architecture itself occurs. 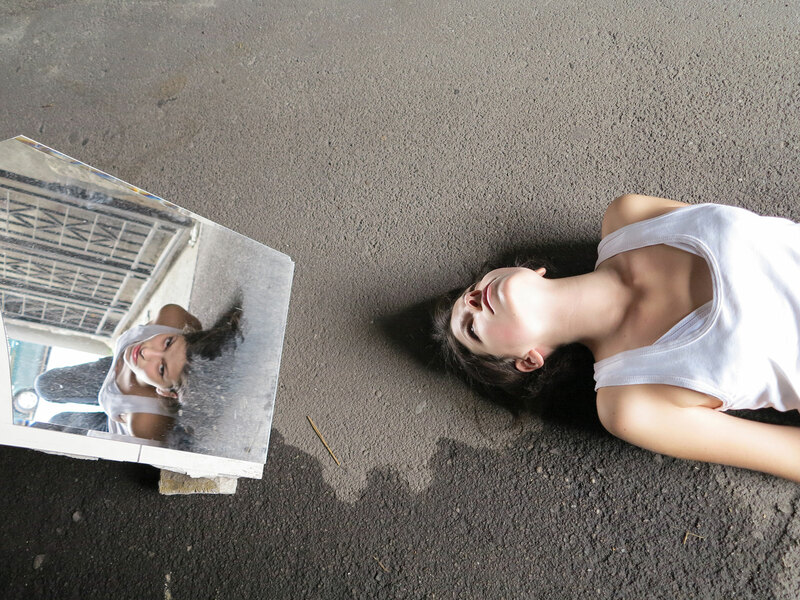 Trust is organic, and like anything organic it rots. 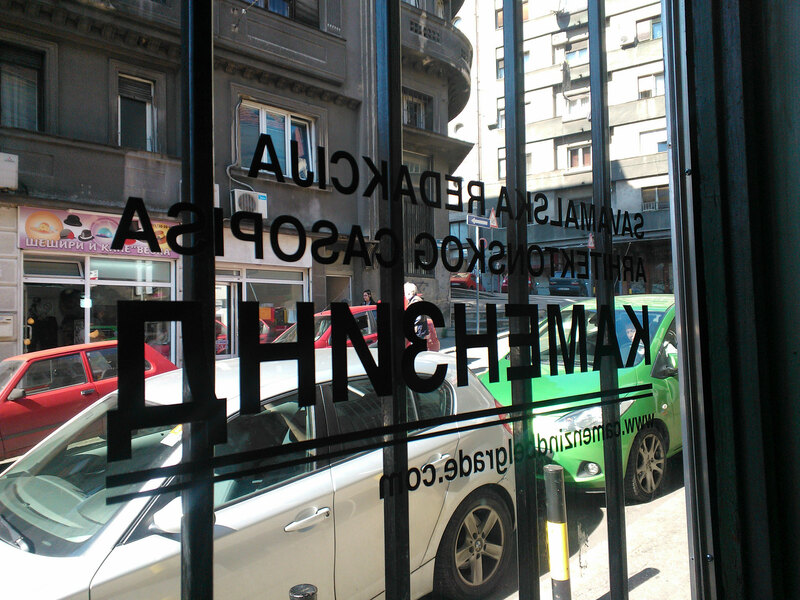 Trust in Serbia seems to be in need of a complete structural overhaul. 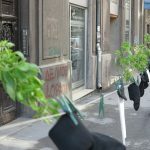 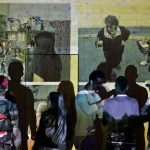 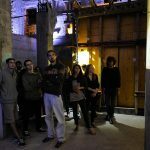 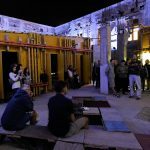 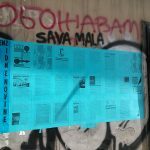 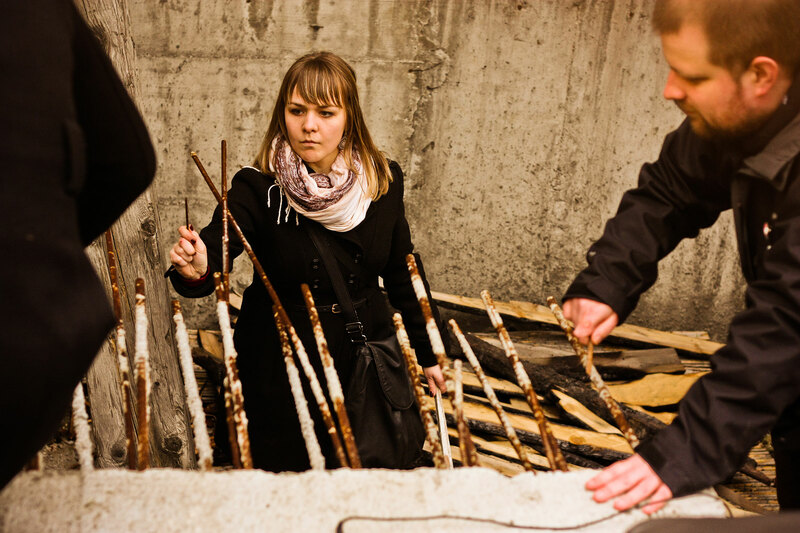 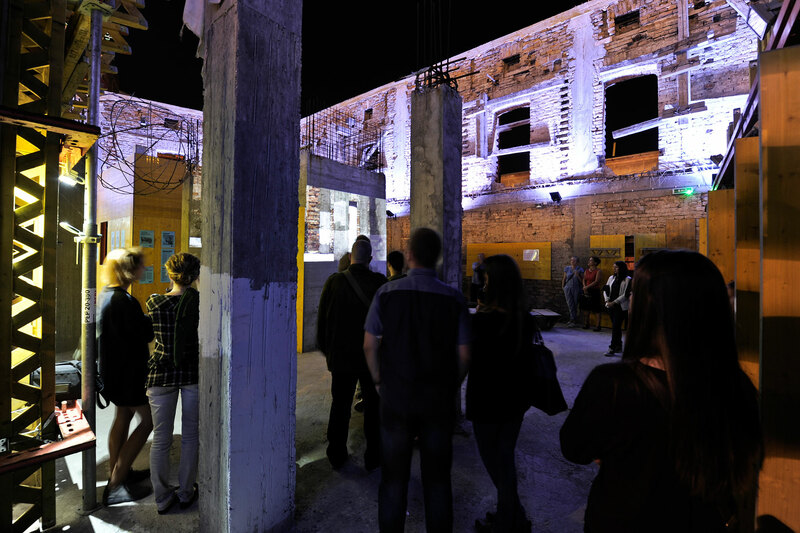 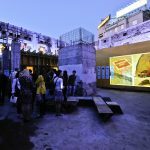 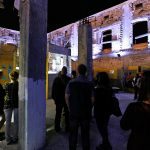 In retrospect it was no surprise that we found ourselves facing a lot of mistrust and indifference from the locals in Savamala but also within the community of architects, artists, social entrepreneurs, et al. 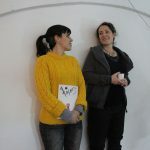 It was hard to get people to participate as many seemed to believe that we too were just working for ‘the developers’. 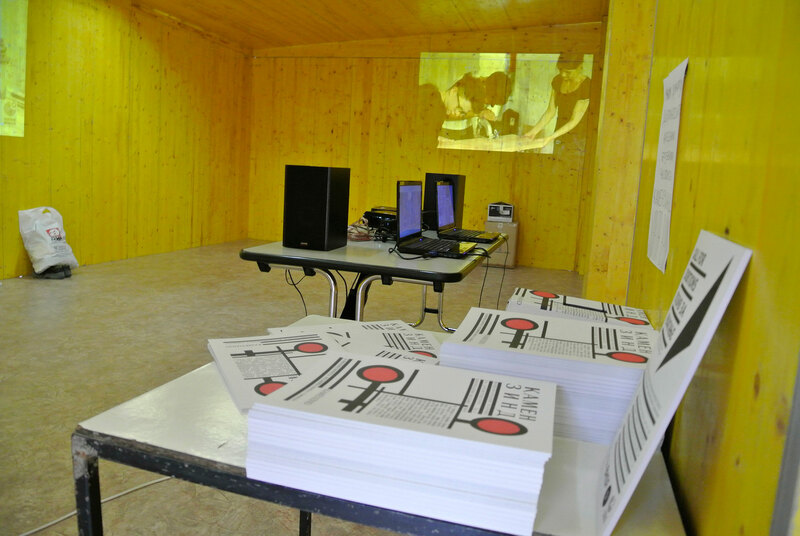 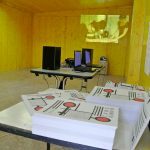 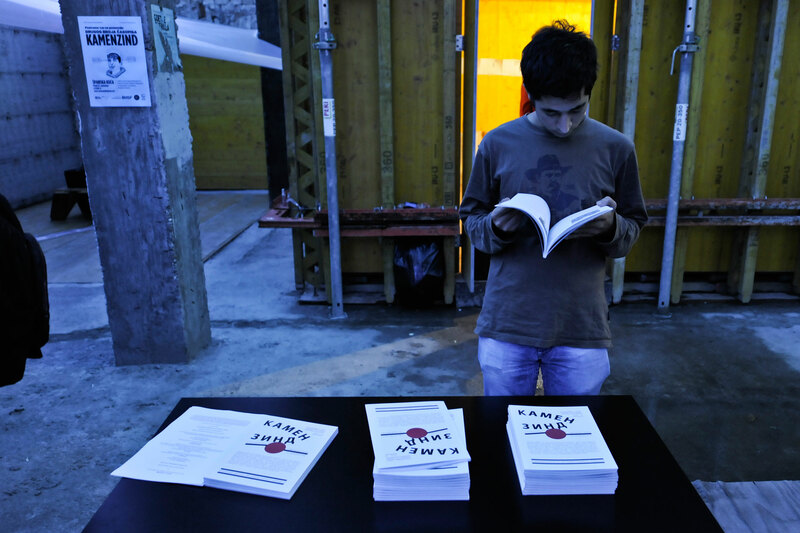 To counter this we planned a range of events, organized workshops, residencies, public lectures and printed matter. 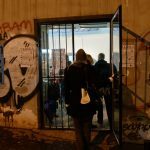 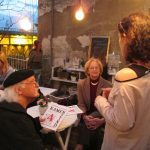 We basically tried everything we could think of and each of these activities brought different people into our space in Savamala. 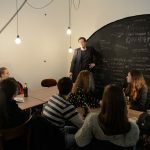 After the first workshop in radio program production, run by Robin the Fog, we found that a small committed group of mostly young graduates and students responded very well to a shot of energy and enthusiasm from the outside. 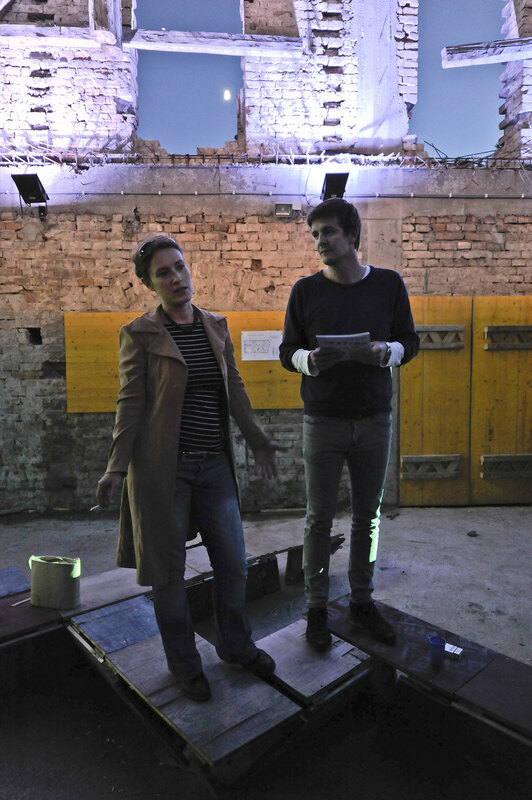 They are full of hope and, most importantly, are undamaged by a sense of ‘how things were’. 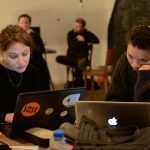 This generation has grown up in a corrupt system and are used to making things happen regardless. 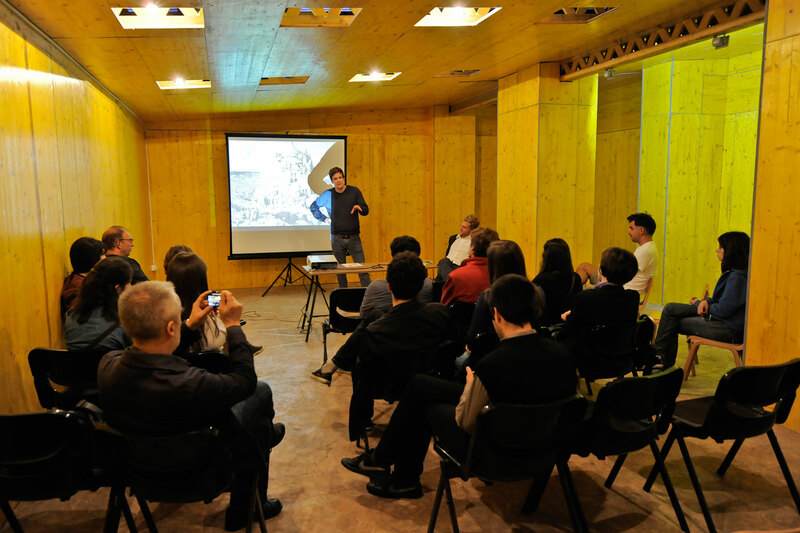 Now looking back this project has to a large extent become about encouraging a new generation of architects and critics. 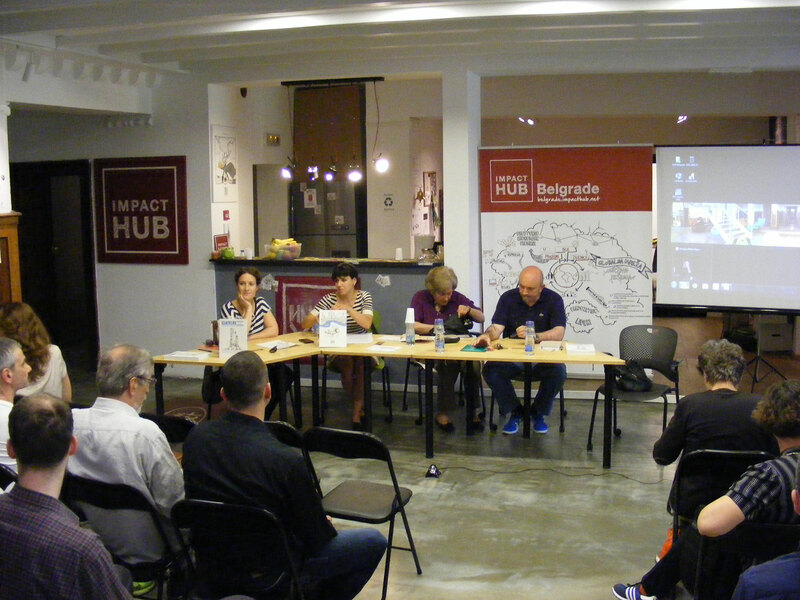 Young people who have voluntarily or involuntarily stayed in Serbia, who want to feel their voices are relevant outside of the Serbian context. 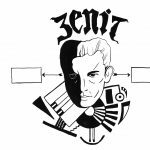 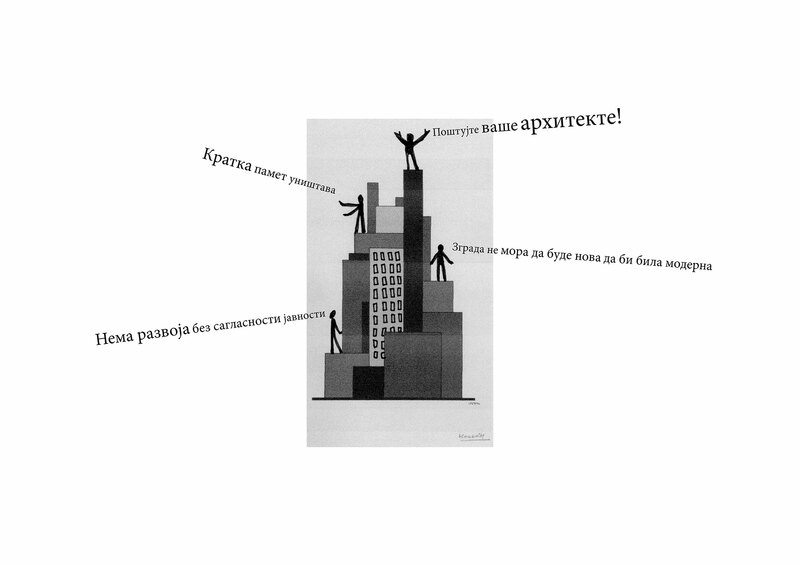 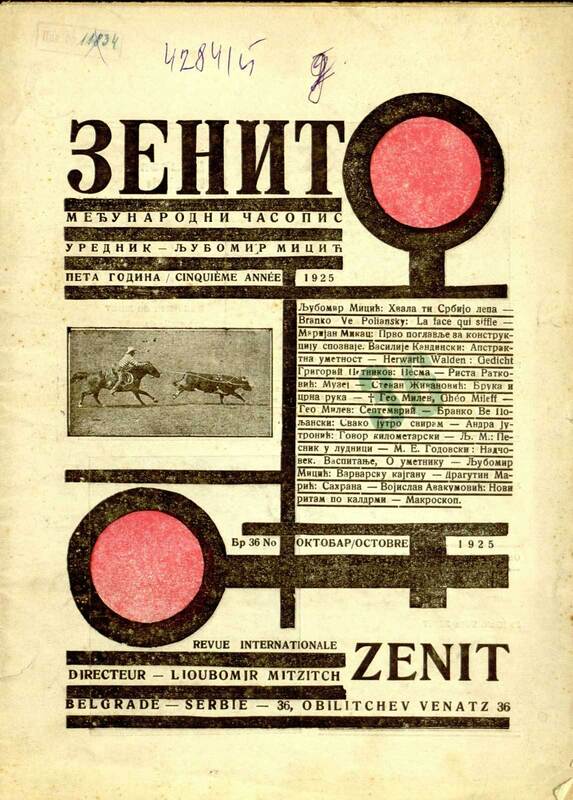 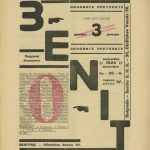 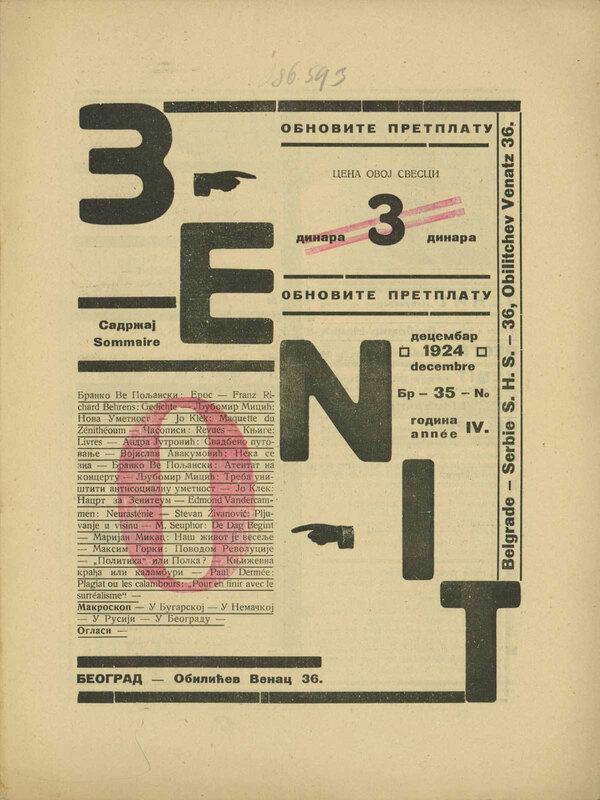 Very conscious of ourselves as outsiders looking in, we wanted to connect with an existing visual culture and we did this by adapting the style of the Balkan avant-garde publication ZENIT. 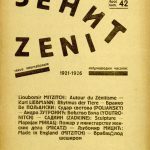 For us, this magazine was a perfect starting point as history is a complex force in this region and the relationship with the past is mired in difficulty. 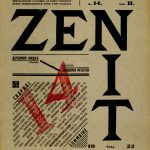 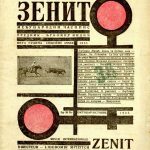 Published in the 1920s, Zenit avoids any reference to all the recent troubles. 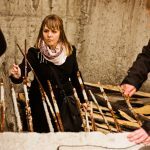 It was a very pan-Slavic art form, one that once represented a spirit and bravery that we felt could be used to inspire the present. 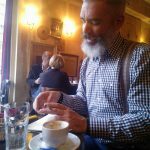 This historical perspective was important because one of our primary objectives has been to try to put a more positive spin on the future and to overcome the cynicism that the future has somehow already been decided by others. 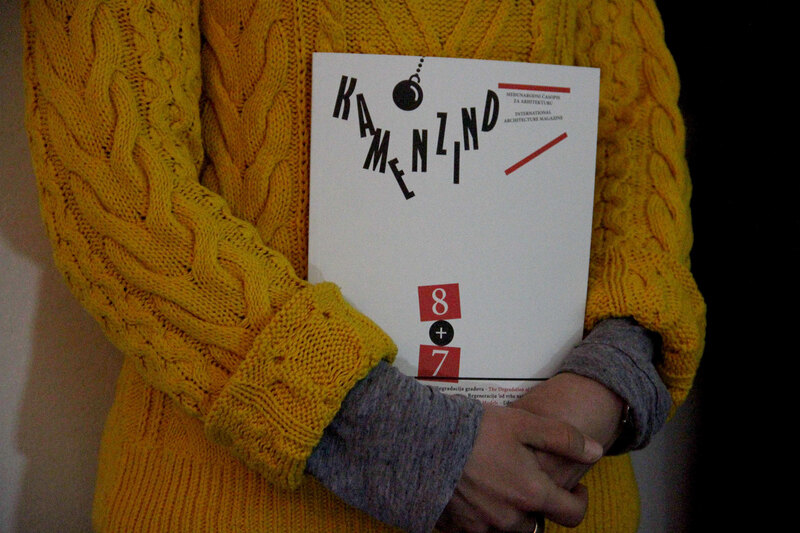 The first issue of Camenzind Belgrade was the hardest to produce, but with it we developed a very strong template. 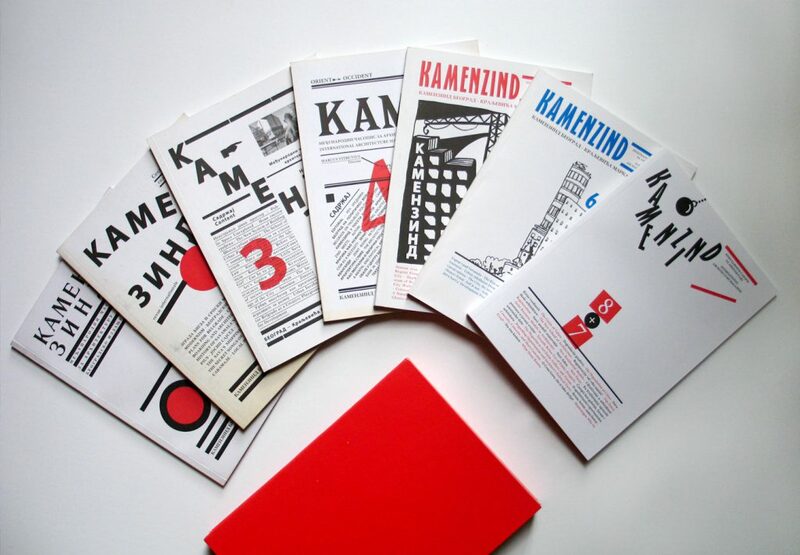 There is much to be said for the power of the printed object. 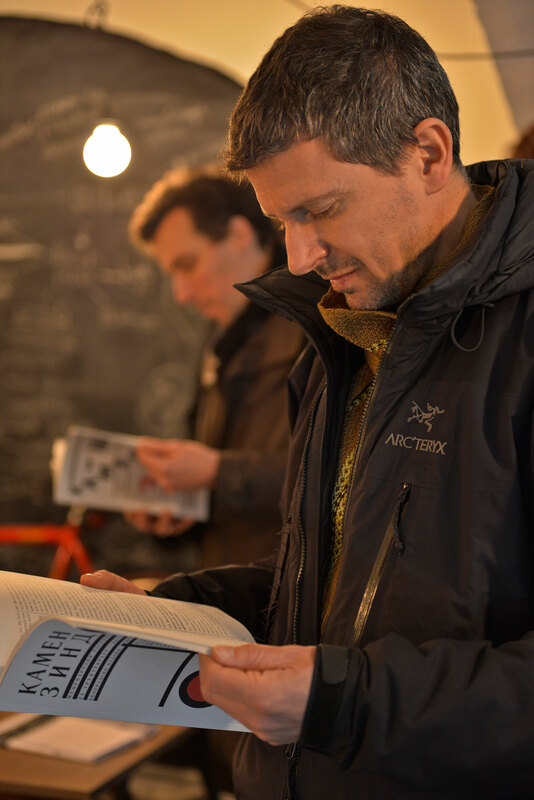 People pay more attention when you press a physical magazine into their hand as opposed to providing links to online ephemera. 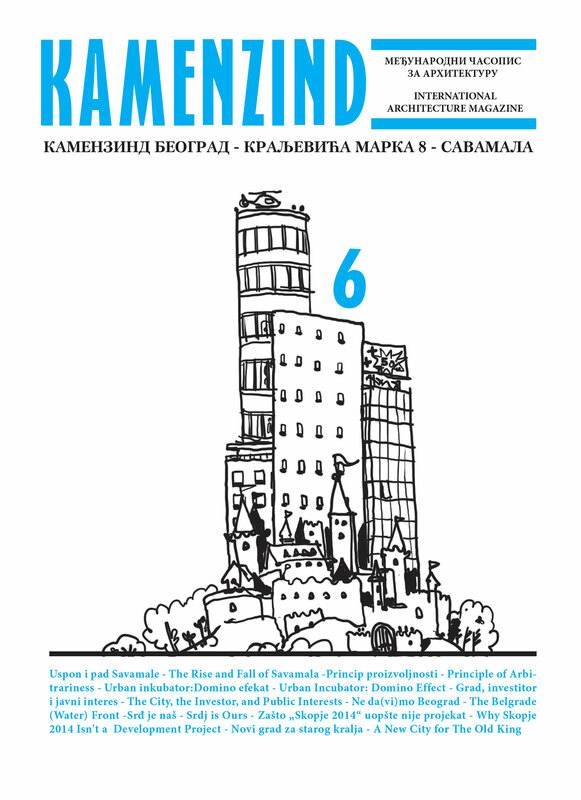 We did not give the magazine a separate name but merely changed the spelling to indicate the Slavic context. 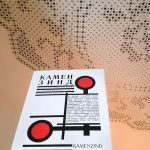 Camenzind became Kamenzind. 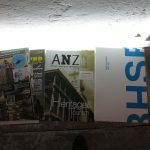 With the name we wanted to indicate that this new manifestation of the magazine is part of a wider conversation. 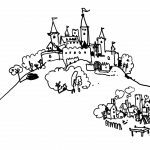 It is both locally distinct and yet internationally relevant. 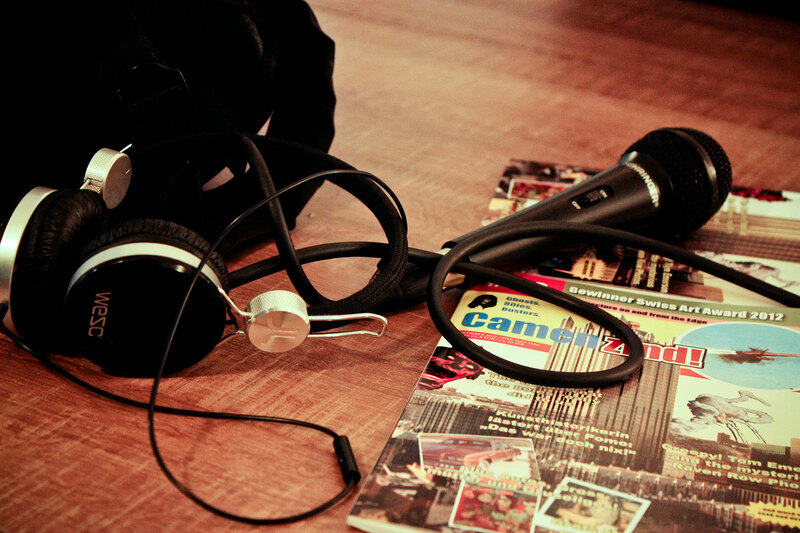 From issues 1-5 we have covered a broad range of topics. 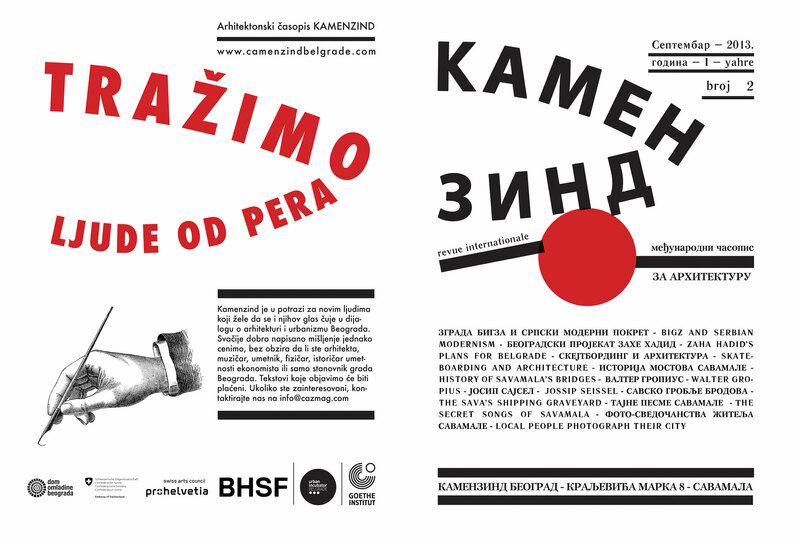 Some, have particularly preoccupied us and been discussed several times in different contexts, these include: corruption and transparency, gentrification, the need to speak-up, and what it is to be an architect in Serbia today (especially a young architect), what role can architects play in Serbian society particularly as important intermediaries between the government, the developers, and the public. 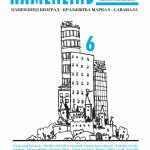 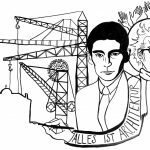 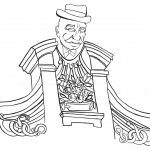 Each issue contains articles by both local and foreign writers and they can vary from history, to fiction, to more theoretical texts or interviews. 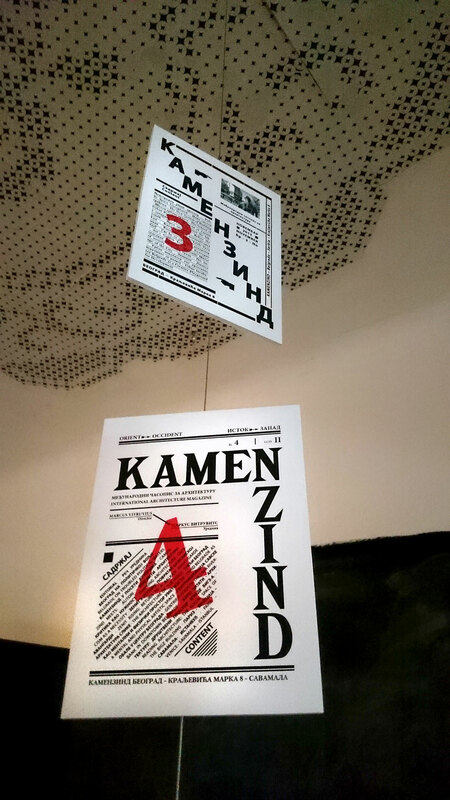 Every article is presented in both languages side-by-side. 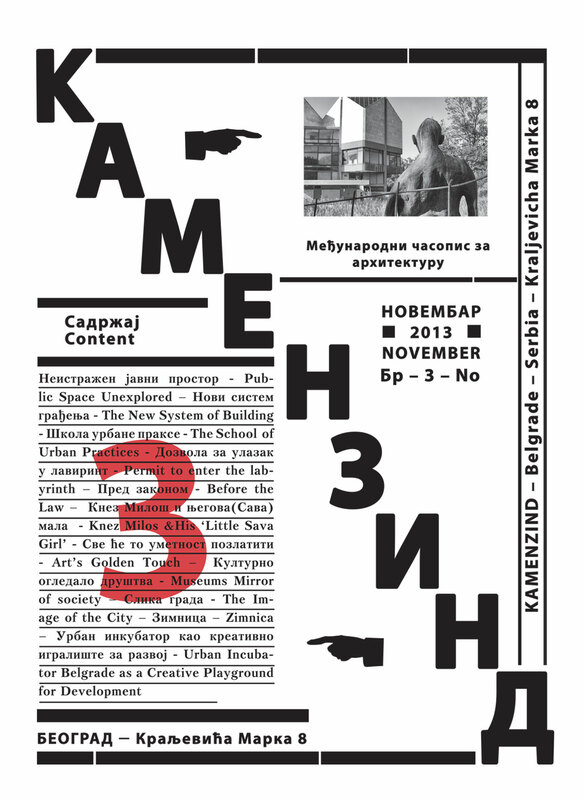 We have had articles on iconic buildings, skateparks, Zaha Hadid’s plans for the historic centre of Belgrade, the absurd lengths required to get a building permit, a warning against the dangers of gentrification, closed museums, new architectural practices, the lack of critical awareness of architecture, a fictional piece about the Orient Express, a profile of the former state printworks BIGZ and most importantly a thorough discussion of the recently announced development plans for Belgrade’s waterfront. 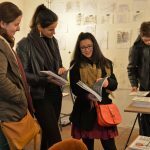 Rereading the editorials at the beginning of each issue one gets a sense of our own changing attitudes to the project and our role there. 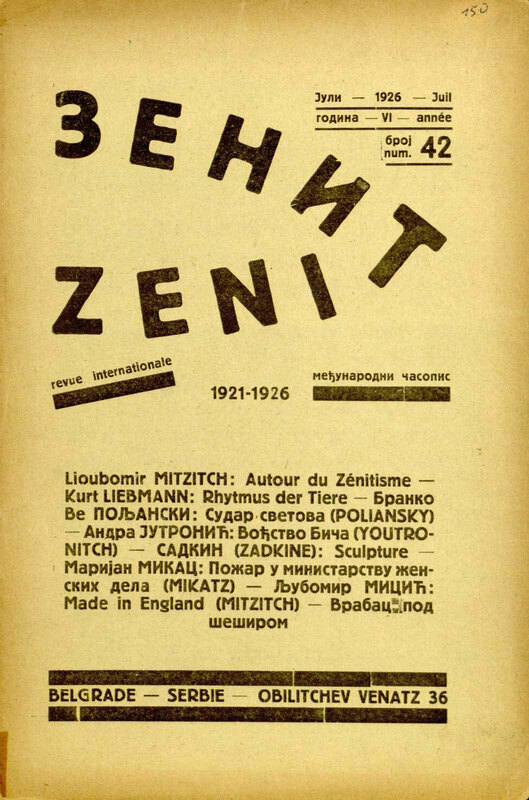 Our initial metaphor for conceiving of the potential of this magazine was similar to the effect of drops of water gradually hollowing out a stone. 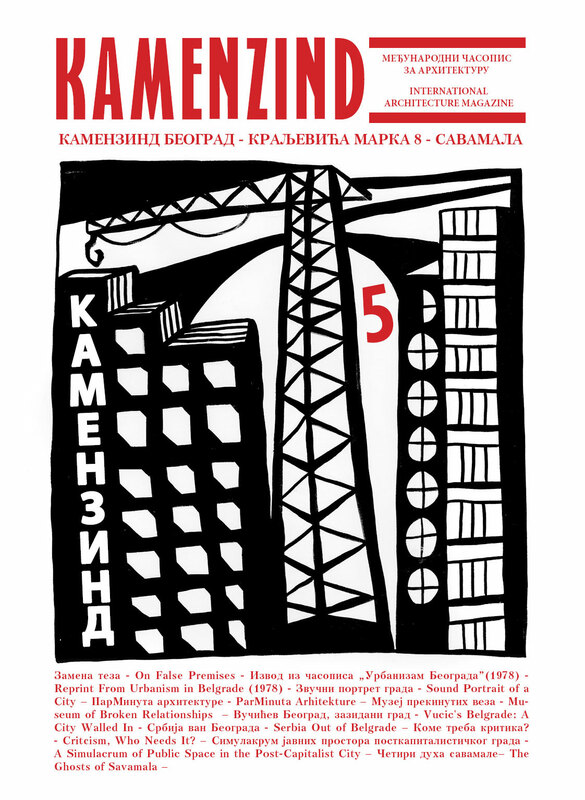 And yet in the final issue there is the sense that time has overtaken us as the giant Belgrade Waterfront development goes ahead at great speed, regardless of any public dissent. 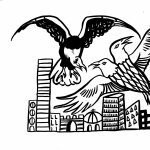 The editorials call over and over for a change in people’s attitude to their environment, that the city is not ten-thousand slices of individual space but a single body everyone shares. 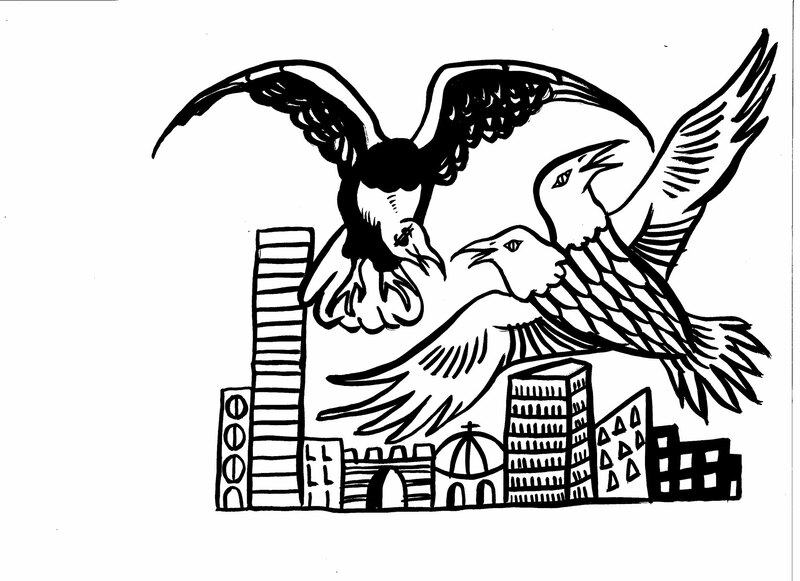 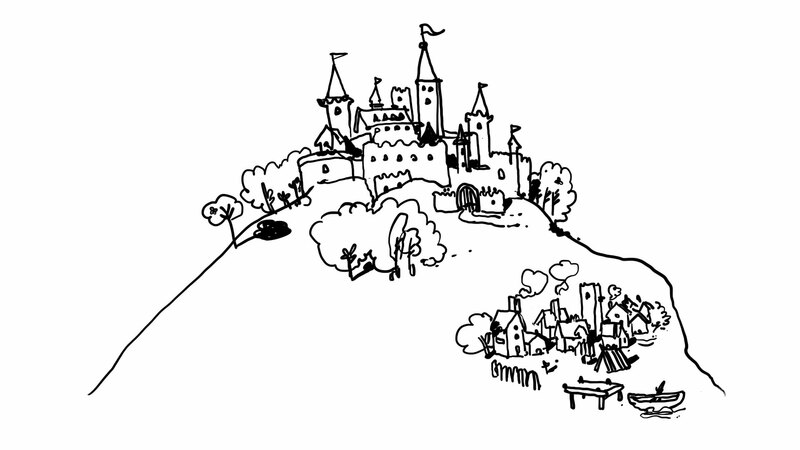 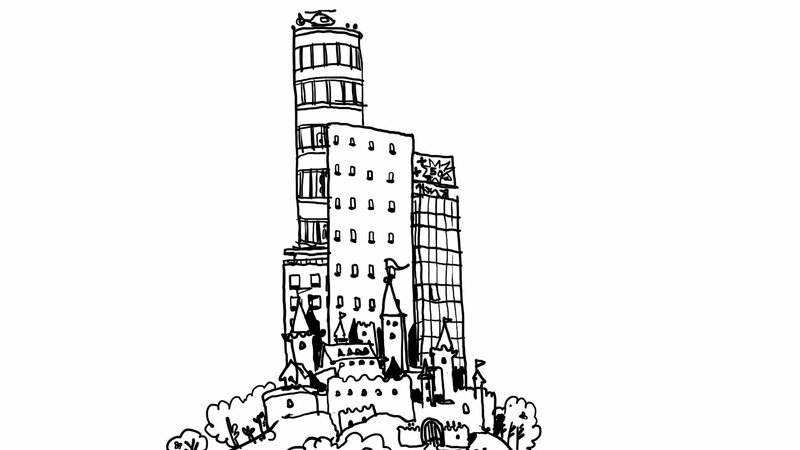 Issue four contained an editorial illustration that incorporated four slogans that seem to be key here: RESPECT YOUR ARCHITCTS, A BUILDING DOES NOT HAVE TO BE NEW TO BE MODERN, SHORT-SIGHTED THINKING DESTROYS CITIES, NO NEW DEVELOPMENTS WITHOUT PUBLIC CONSENSUS. 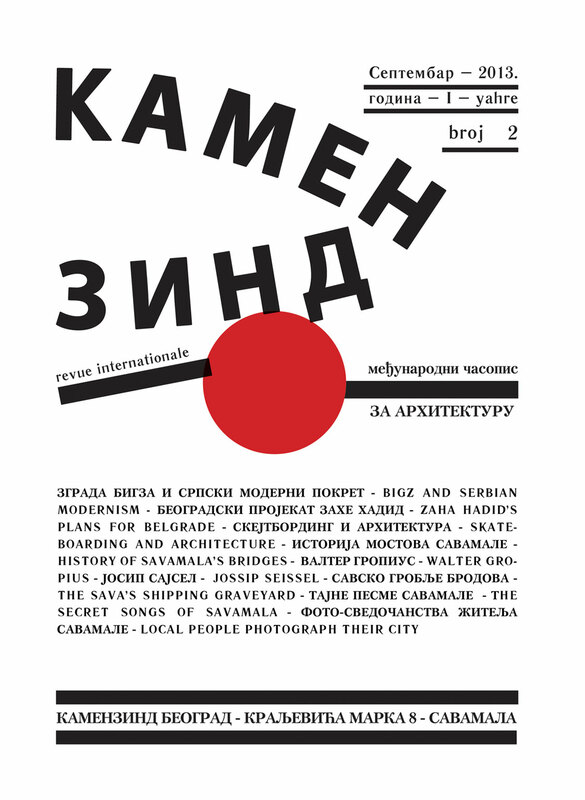 Now with the arrival of the Belgrade Waterfront development we have tried to remain level-headed and not be instantly and overtly critical of the project, which is all too easy, but instead offer a clear and honest debate on the pros and cons. 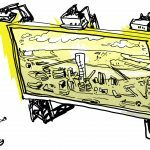 Investment is good, but the lack of transparency is alarming and there has been no invitation for the public to register their concerns about a project that will have a huge impact on the city’s skyline for generations to come. 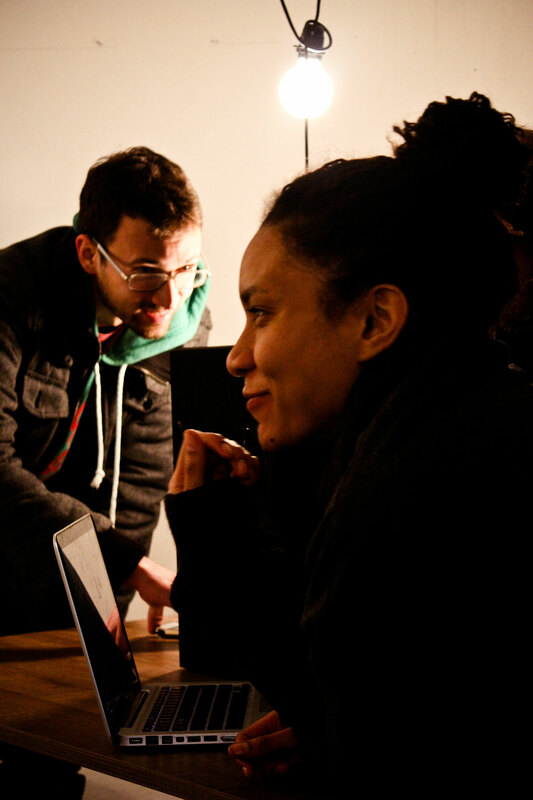 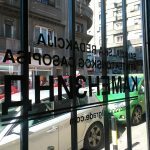 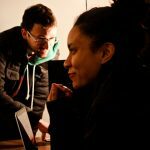 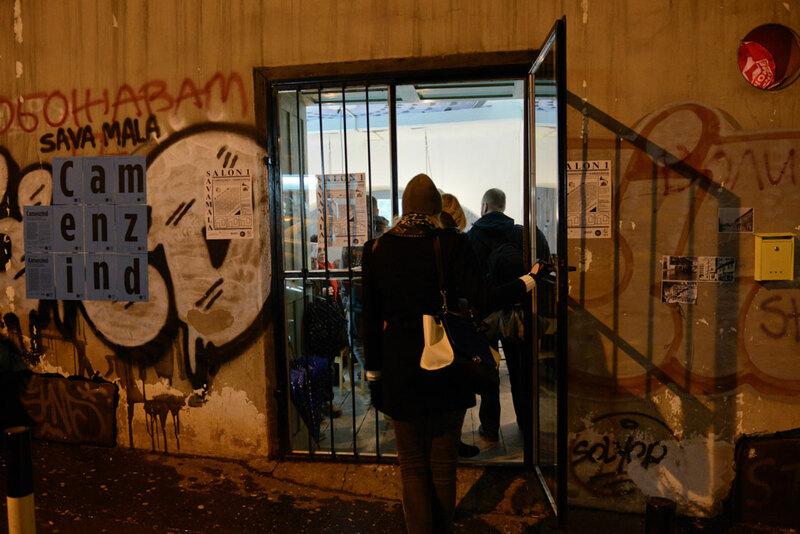 As for our own continued presence in Belgrade, we wanted to separate ourselves from the hit and run project-based mentality of cultural funding and always had the desire to establish something lasting and evolving and ultimately self-financing. 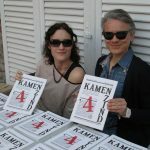 It is no good building up an interested readership only to abandon the project once the grant money runs out. 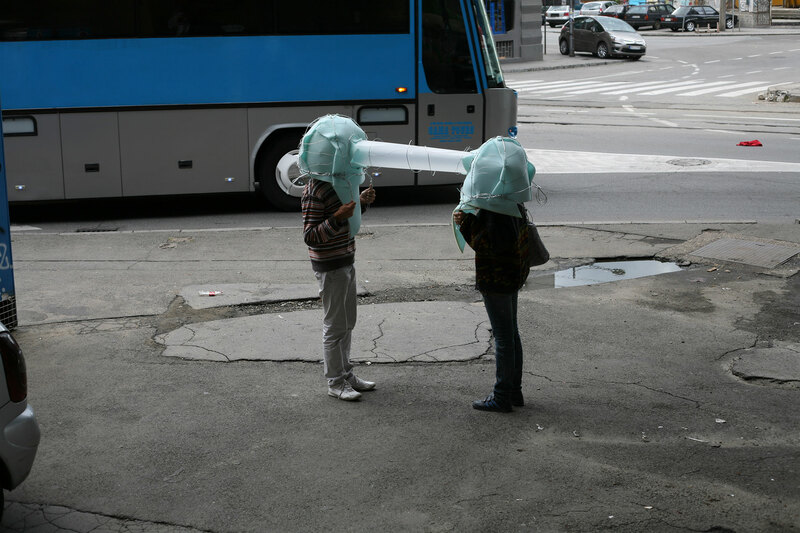 But this is a long game and we shall have to see what happens. 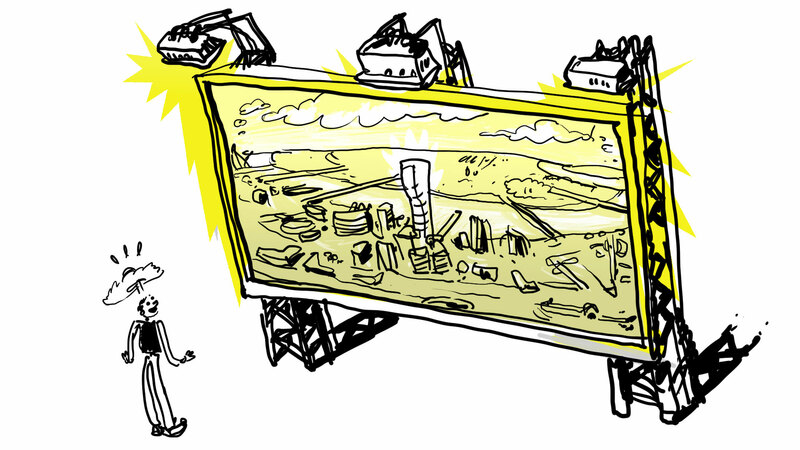 There is with any community-based project always a gap between expectation and outcome. 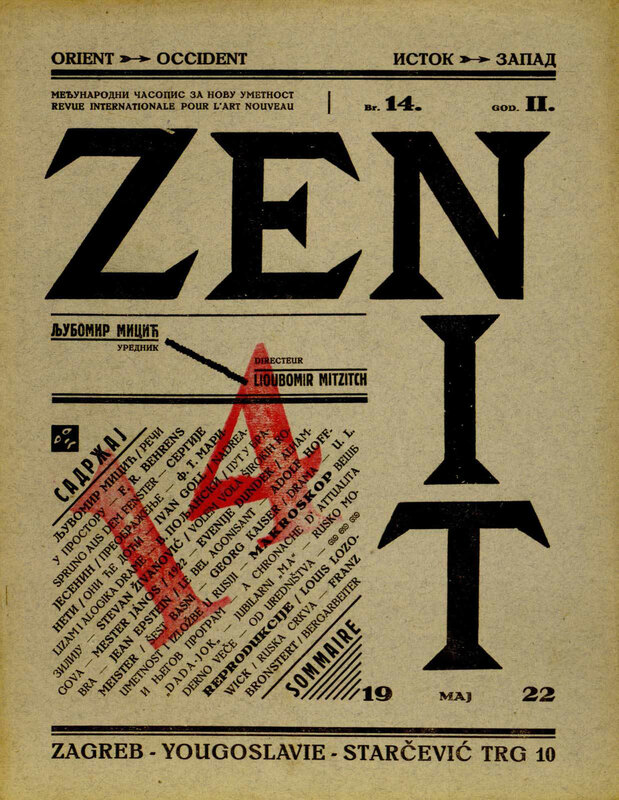 One must be endlessly pragmatic and not lose faith before the results begin to show. 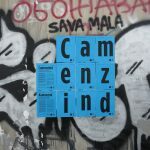 Camenzind’s main focus in recent years has been to find ways to bring new voices to the debate on architecture and the future of cities and to facilitate a new form of knowledge-sharing between parties. 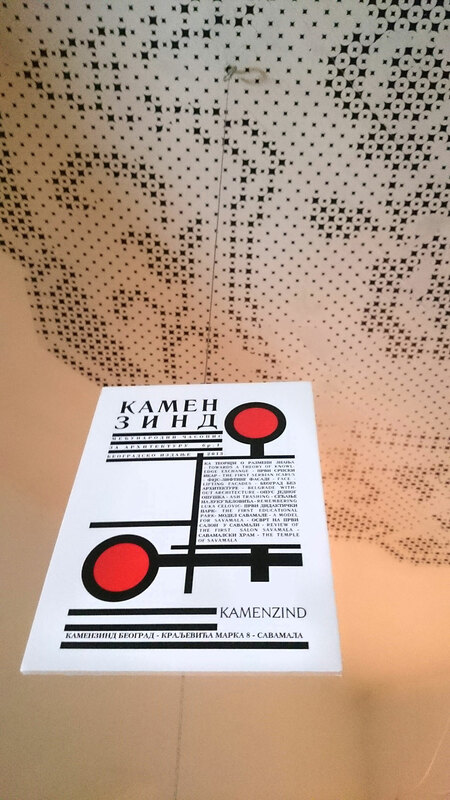 The staff of Kamenzind Belgrade has endeavored to provide the general public with a better understanding of architecture and its impacts, as well as inspire them to take a more active role in shaping the building environment around them. 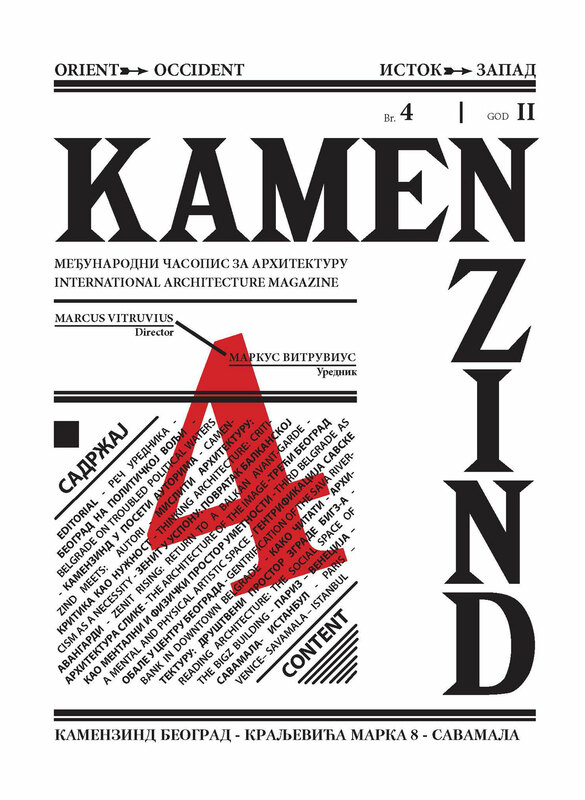 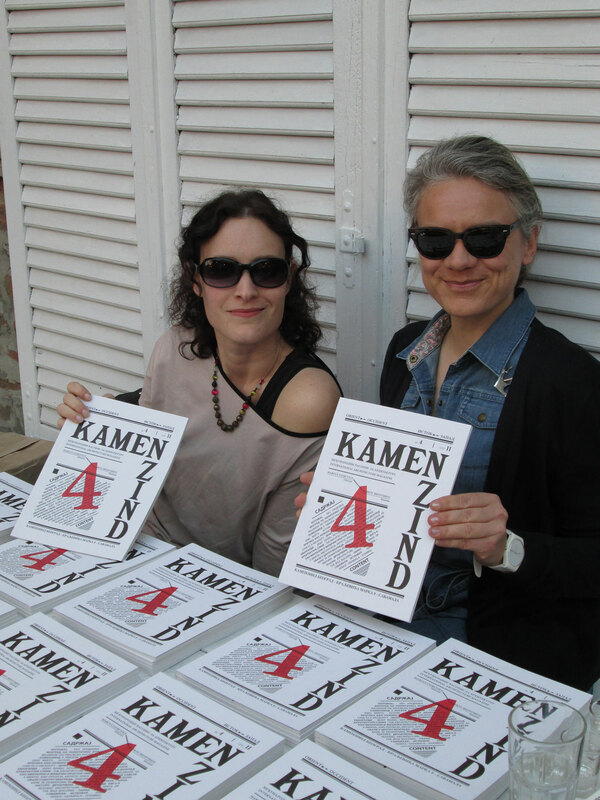 After two successful years and 5 issues out, Kamenzind continued to live independently as Belgrade based international magazine, run by a Belgrade based practicing architect and researcher Ljubica Slavković and Ana Đorđević. 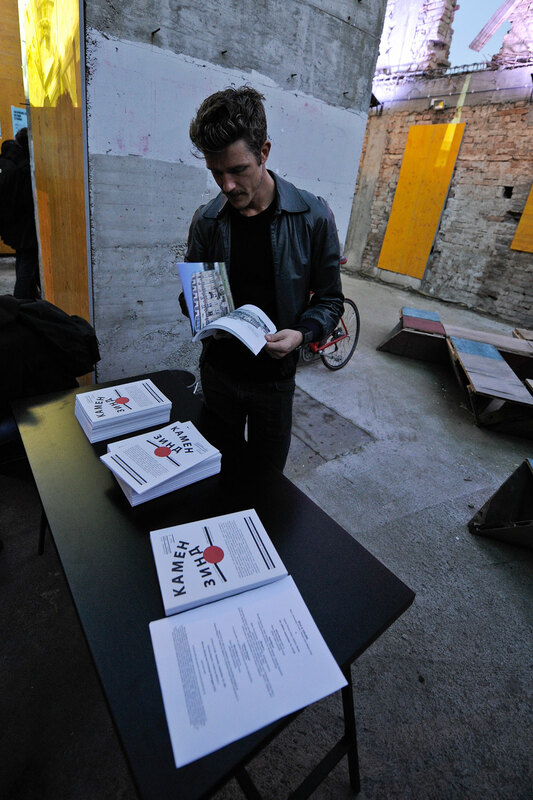 Since then, 3 more issues have been published. 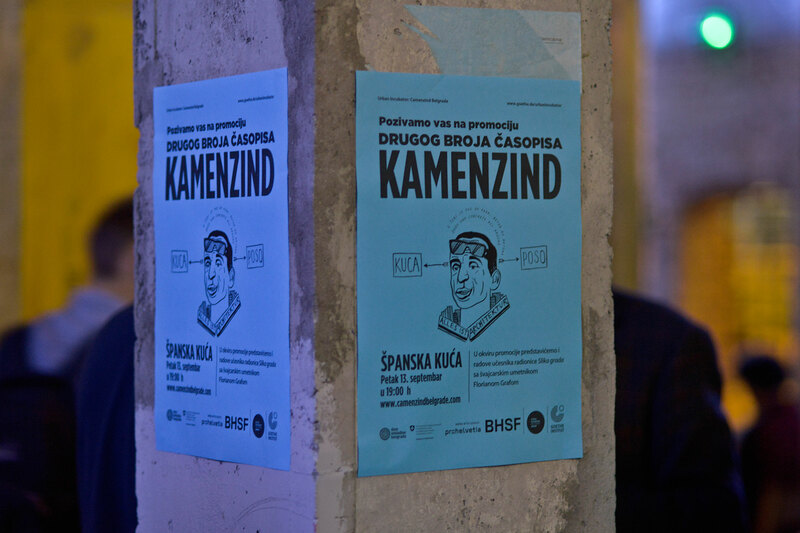 During the project existence, Camenzind had had its temporary working space at the Kraljevica Marka street. 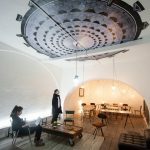 While there, BHSF had hired two young architects Tamara Popovic and Iva Bekic to design the interior. 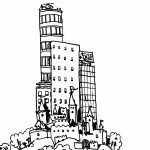 A very special situation was at stake, where architects designed for architects, with virtually non-existing budget for delivery. 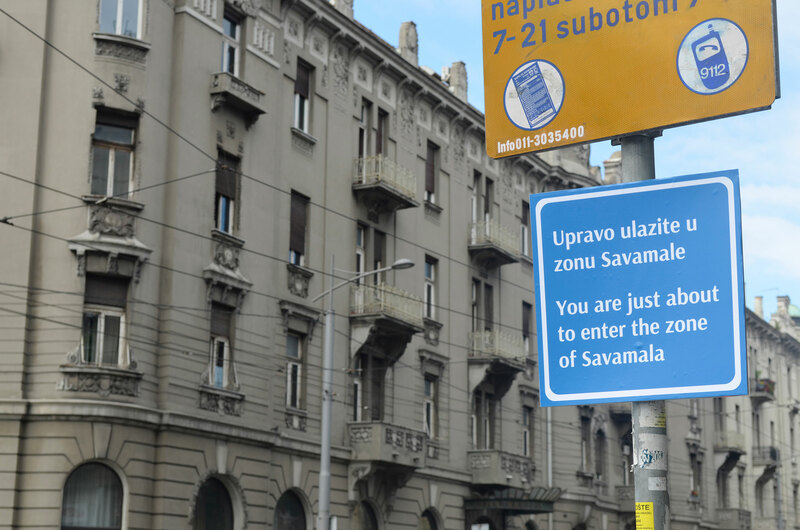 The residential building at which ground floor were the two rooms of the magazine, had been built in 1837, and annexed in 1852, and it belonged to a Jewish family of merchants.The ground floor and the basement had been used as the stockrooms with a floating connection to the Sava river. 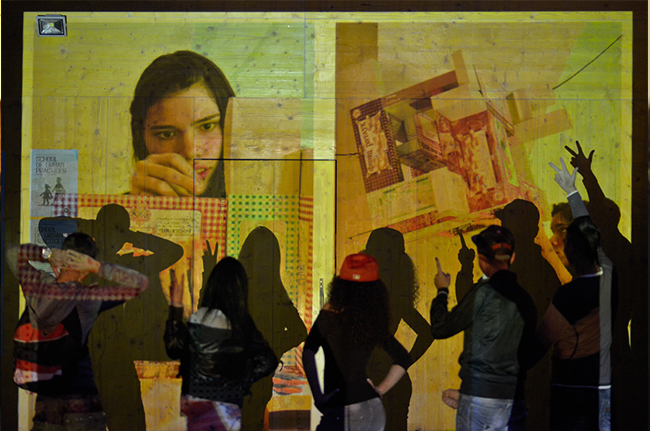 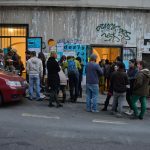 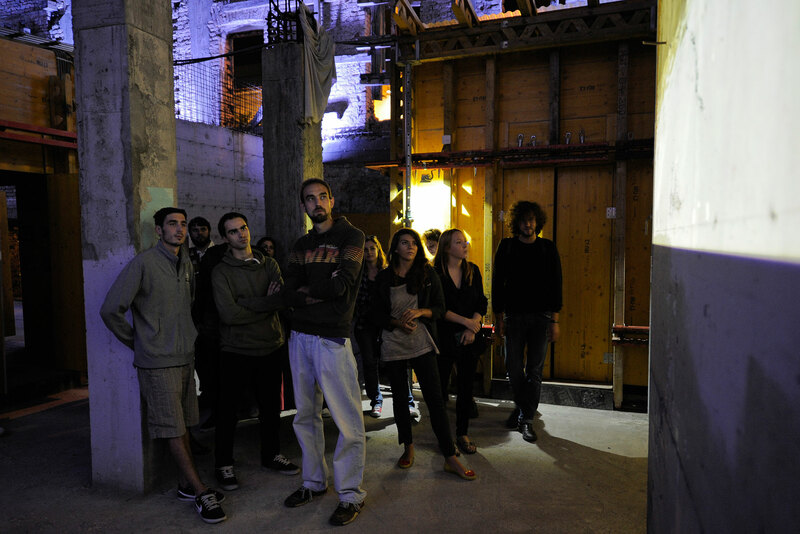 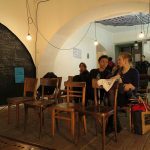 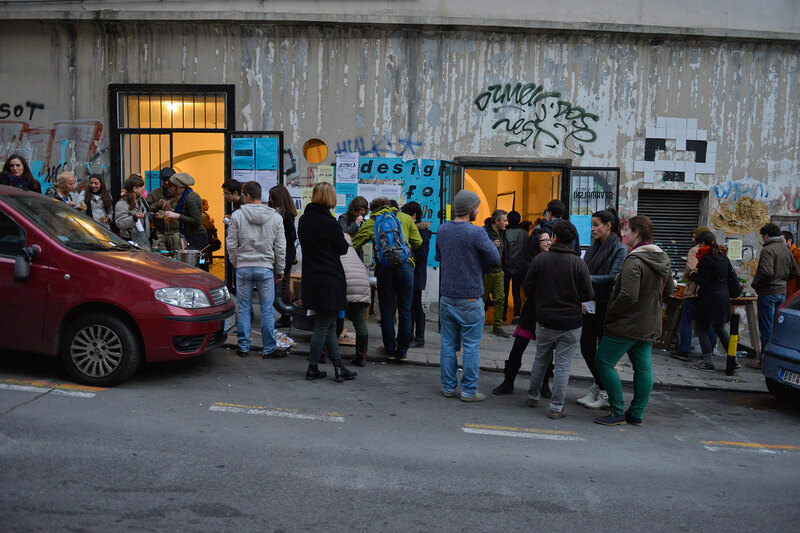 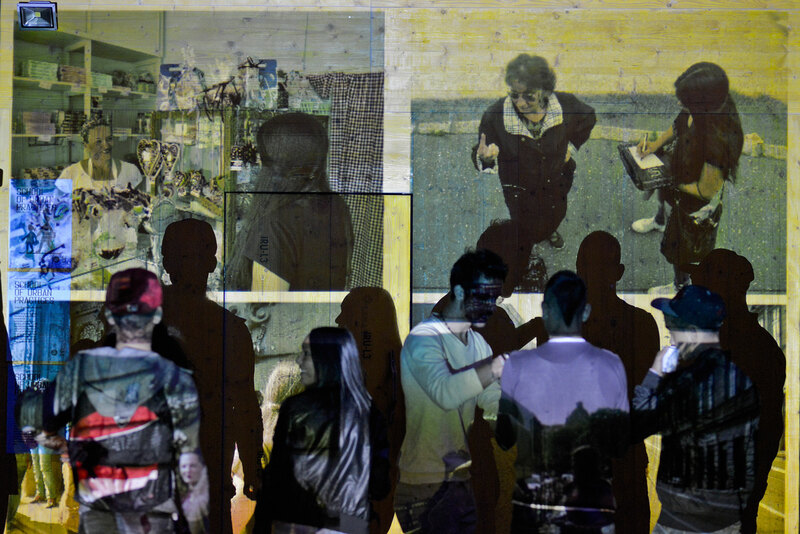 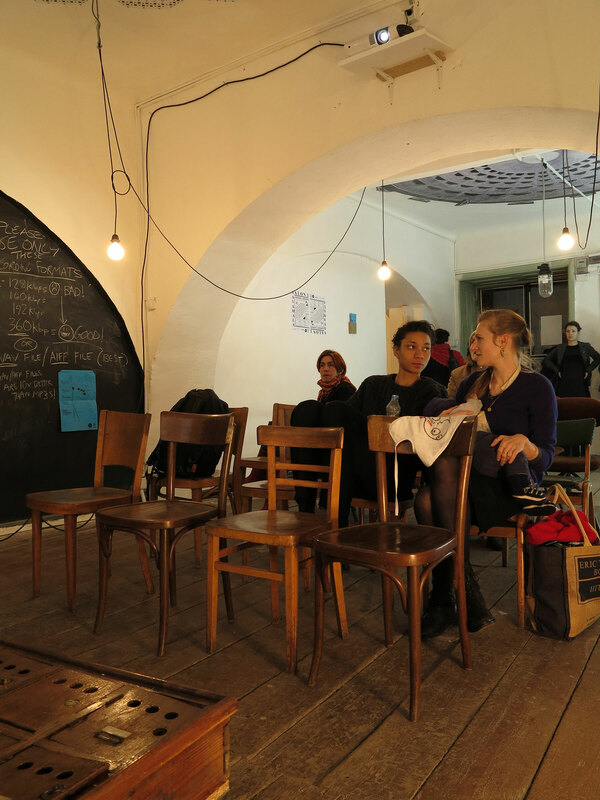 Before the BHSF, the space was used by the Belgrade Youth Center as a gallery space. 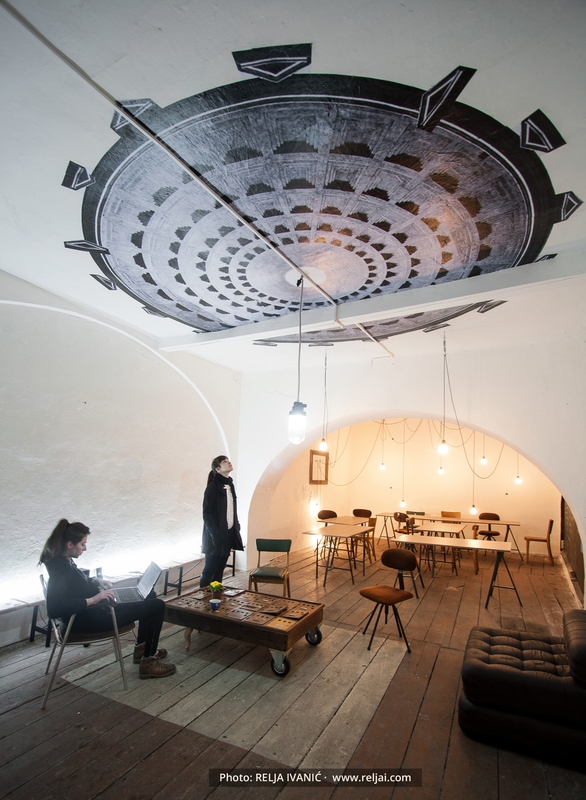 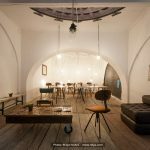 For designing the space, the two authors had been rewarded the first prize at the 36th Architecture Salon, in the category of interior design. 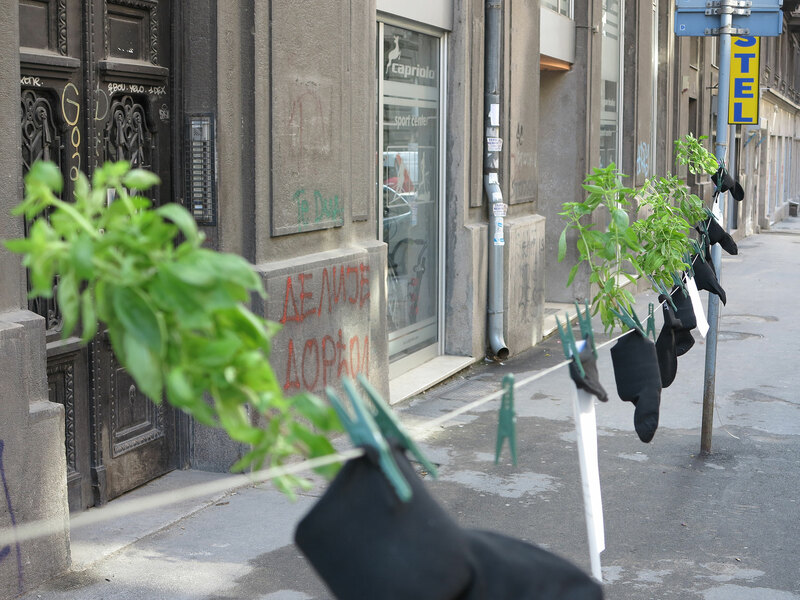 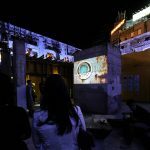 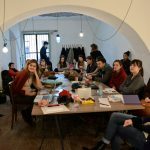 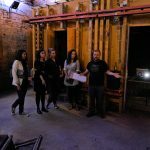 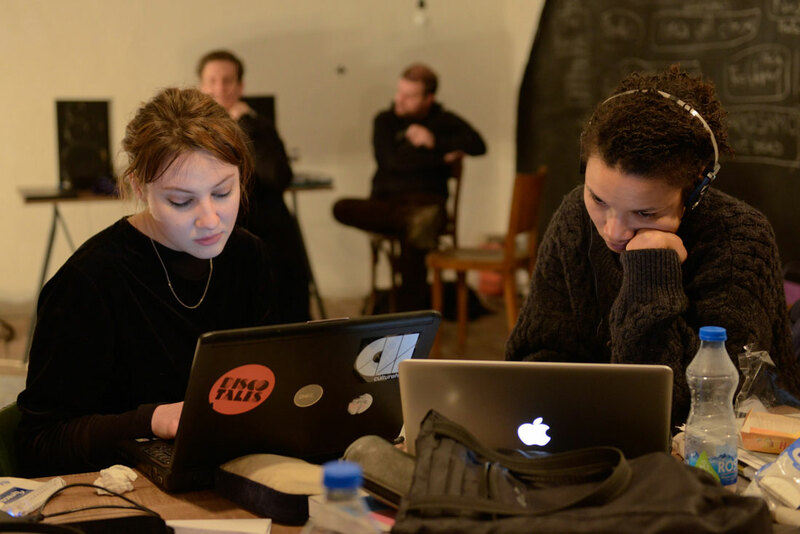 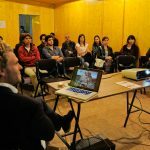 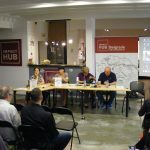 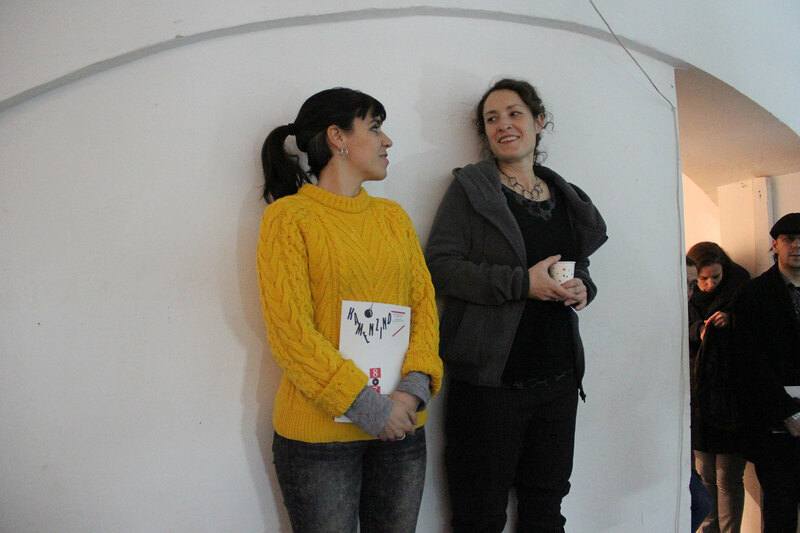 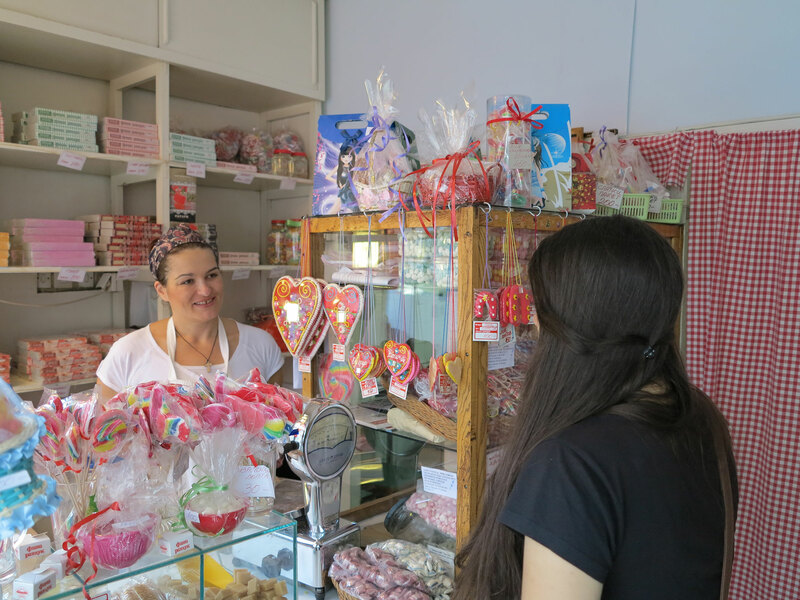 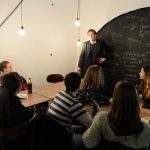 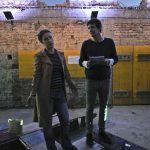 As part of the Urban Incubator revitalization project, Camenzind has centered its activities around four core weeks in Savamala over the year . 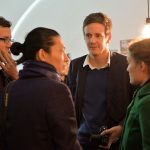 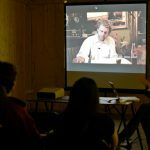 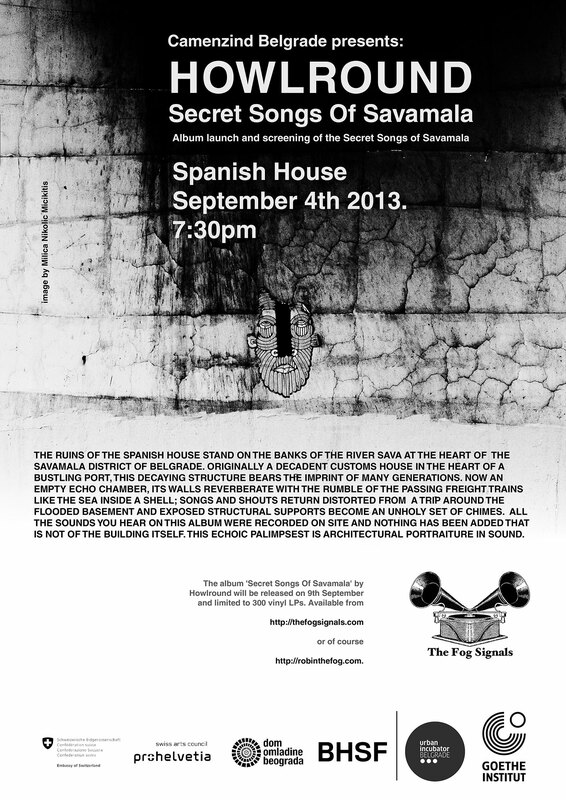 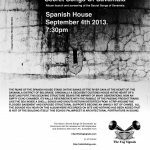 It was planed for each of these weeks to be hosted by an invited expert – a radio producer, an art historian, an artist and a curator- and each of them to present their work one evening in the form of a Salon. 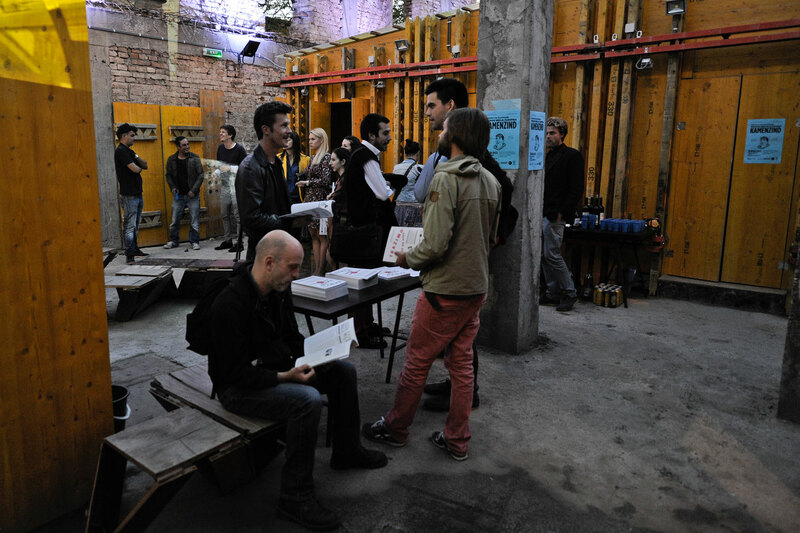 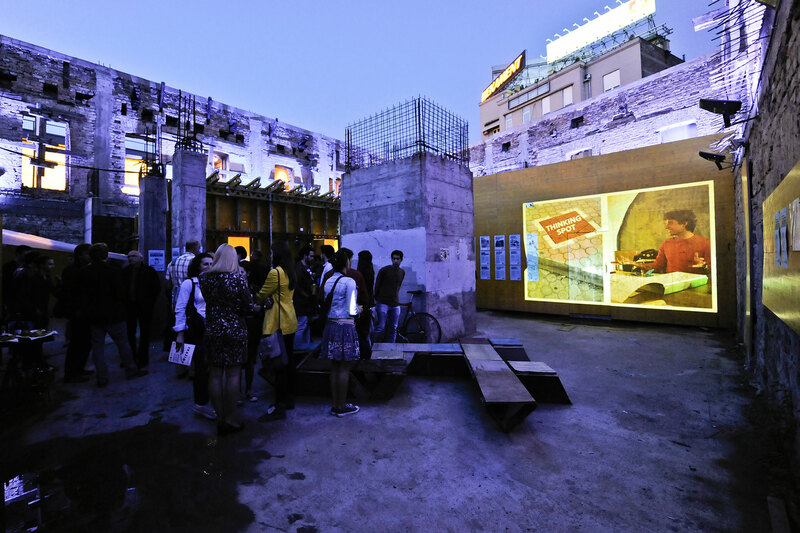 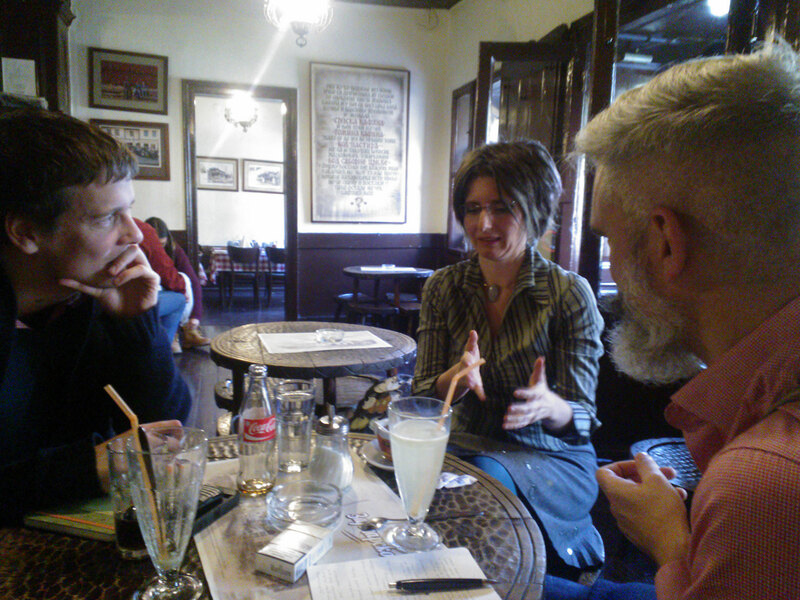 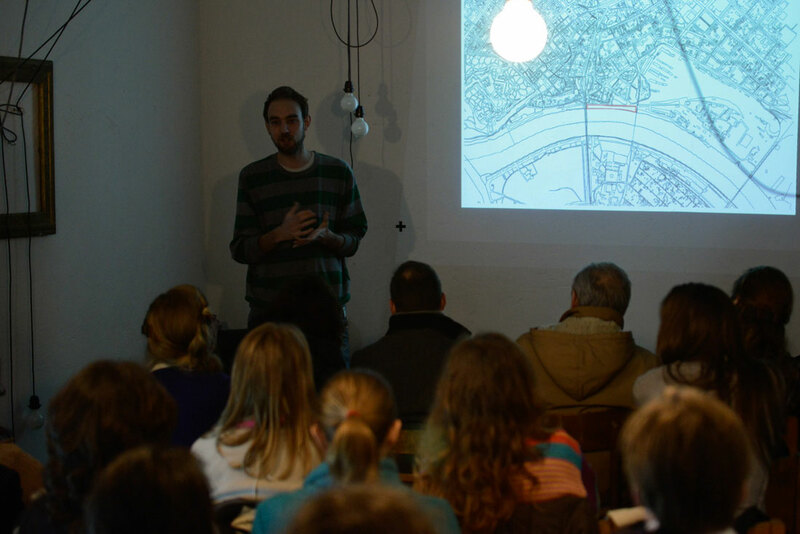 Robin Warren centered the first week on exterior spaces and public spaces in Savamala. 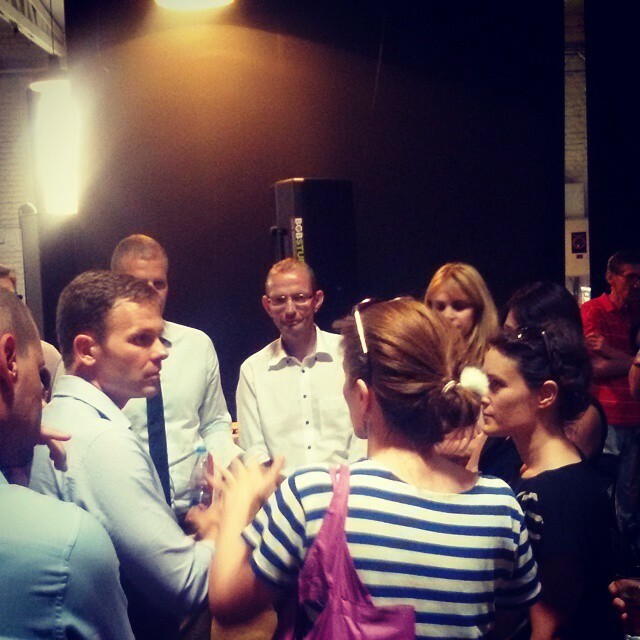 He also gave the Camenzind goes Belgrade Team an introduction into radio production. 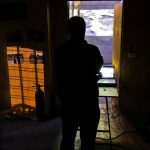 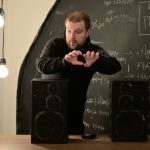 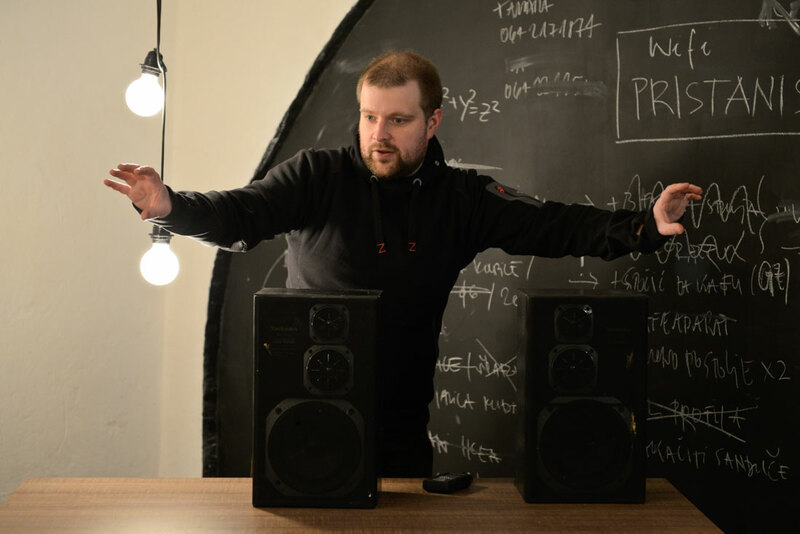 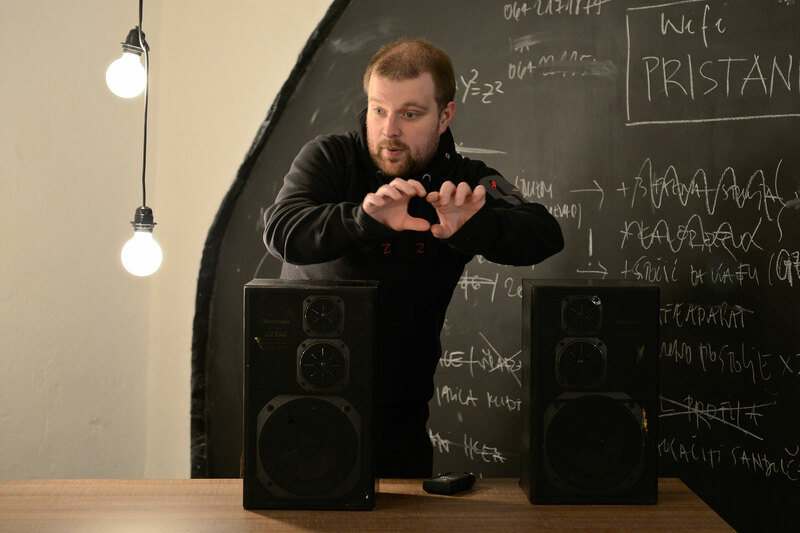 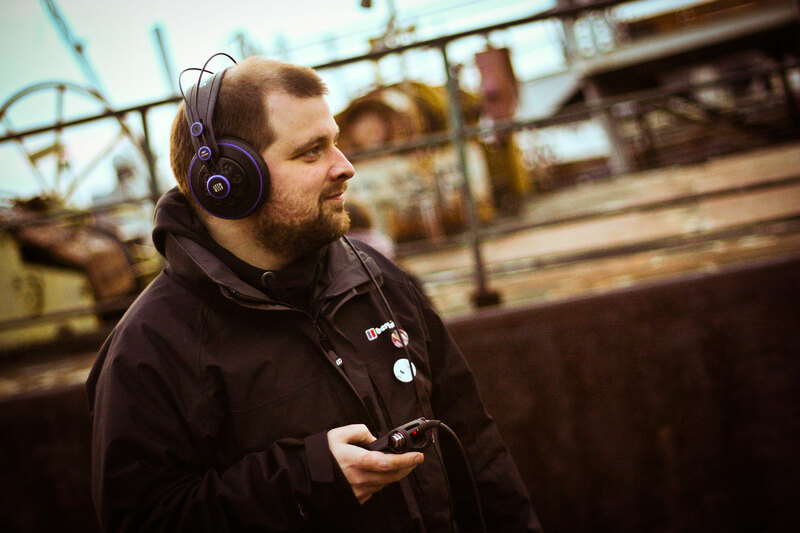 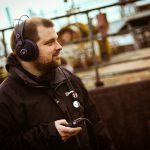 Robin spent a week teaching our participants how to record and edit their own radio documentaries, to seek out stories in Savamala in order to create a series of radiophonic portraits that combined history, field recordings and interviews with local people. 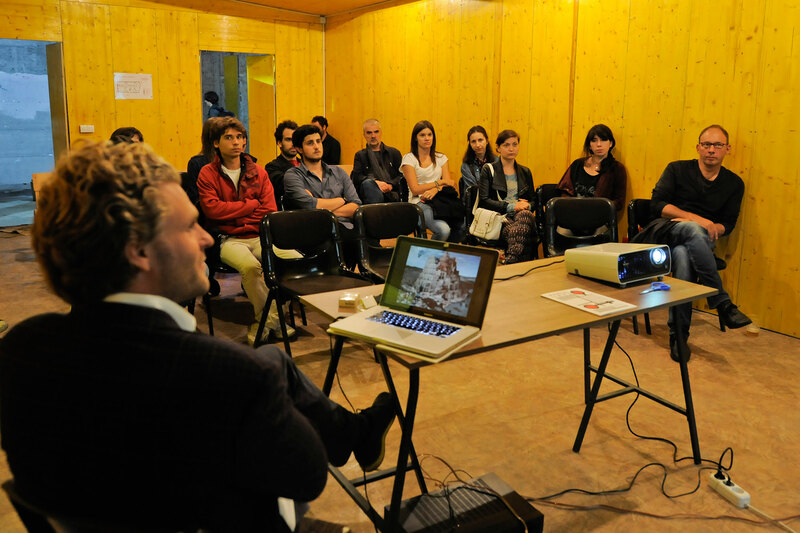 Florian Graf was invited by Camenzind to hold a workshop with students in Belgrade during the second week of September 2013. 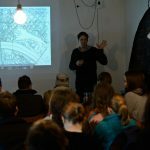 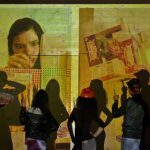 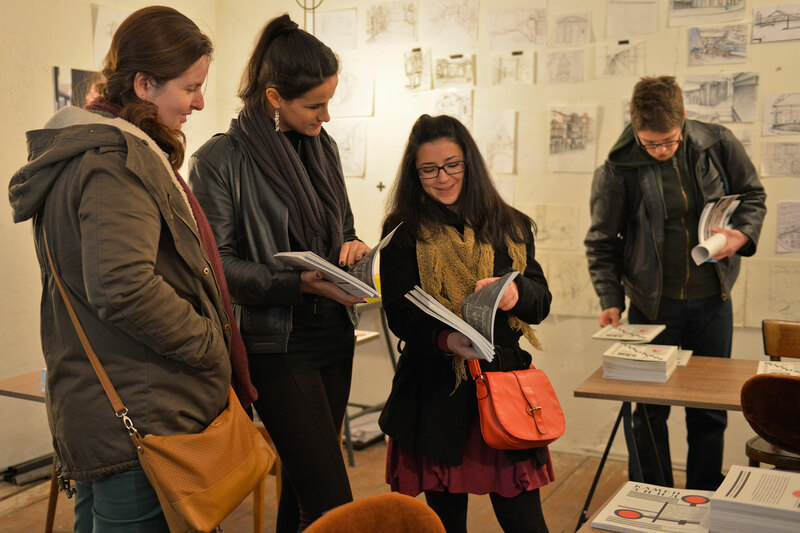 He started drawing and discussing with the students, wondering through Savamala, harnessing the spirit of “The Image of the City” by Kevin Lynch and testing methods of the situationists. 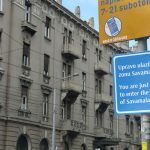 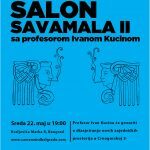 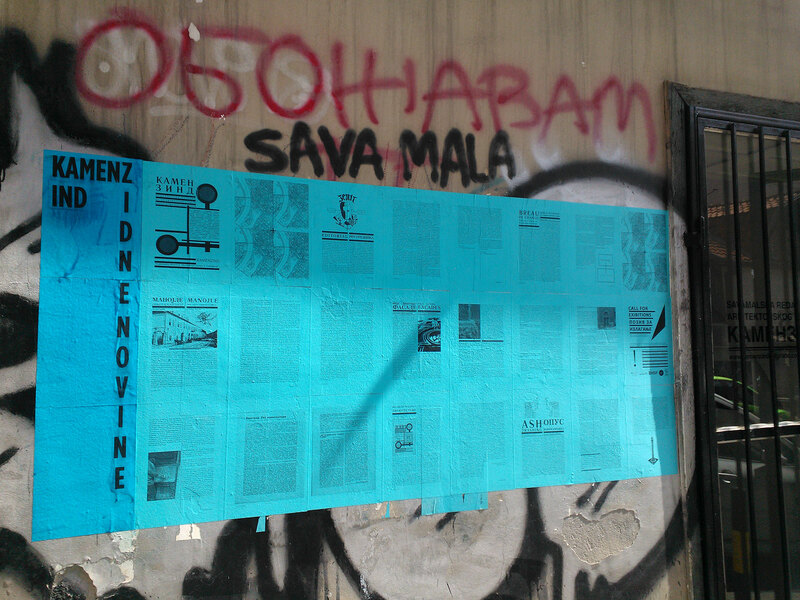 Con-fronting our sensual prejudices as a means of reassessing the reality of the area of Savamala. 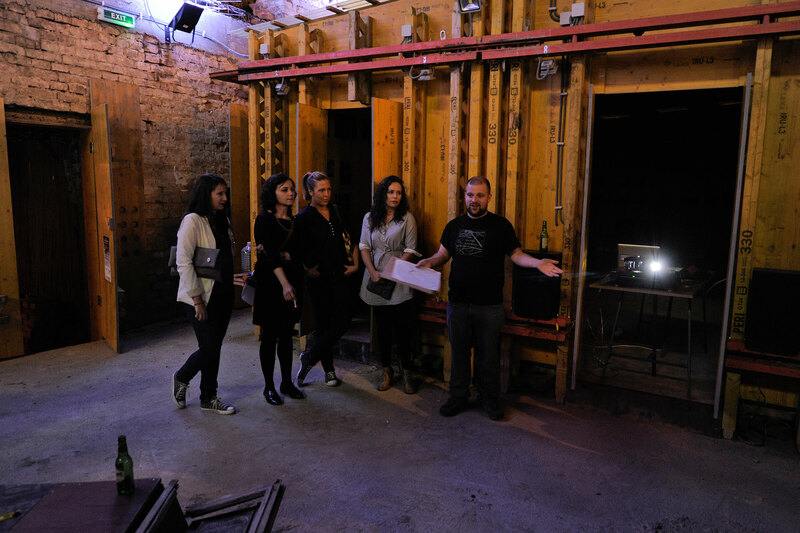 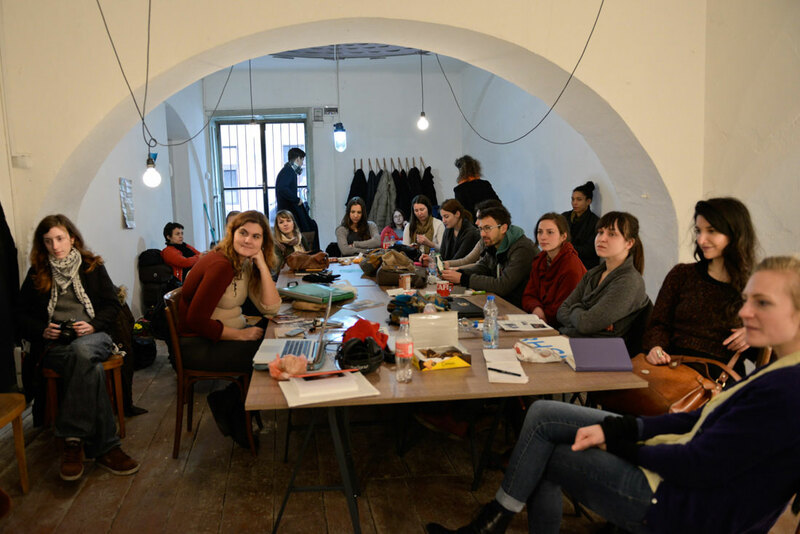 The workshop proved to be a very fruitful week with enriching cultural exchange, creating new meaning and gaining new knowledge about Savamala. 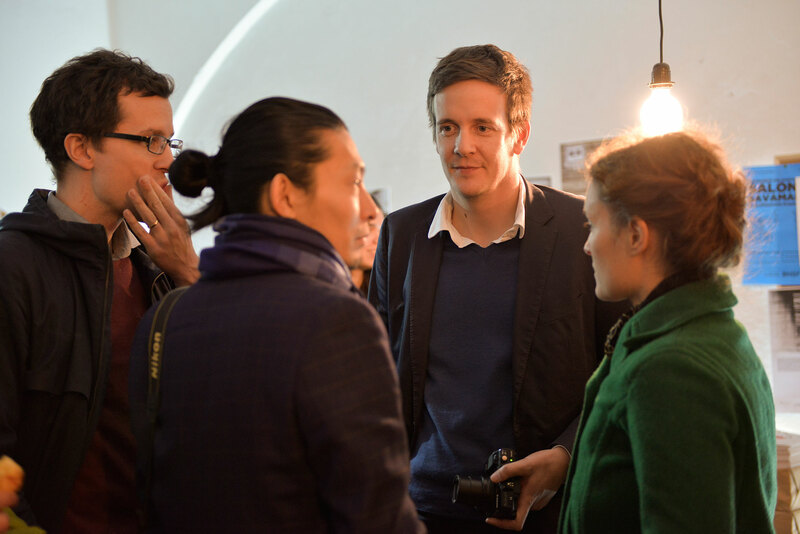 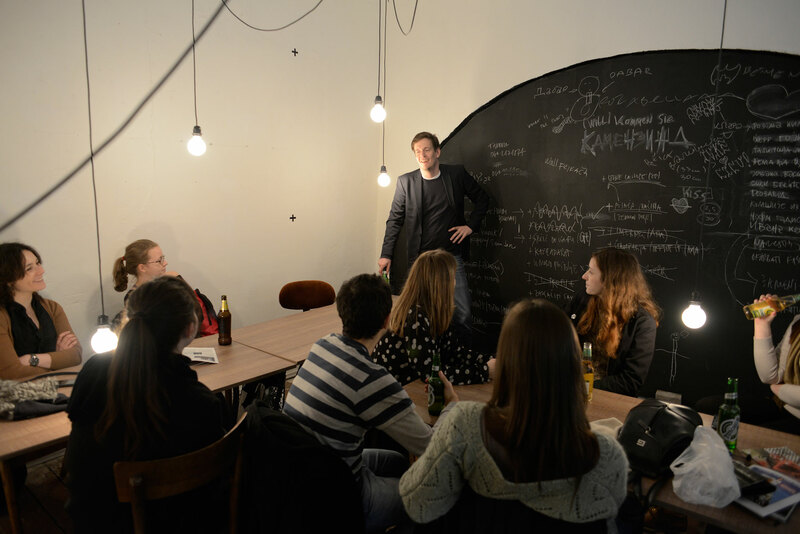 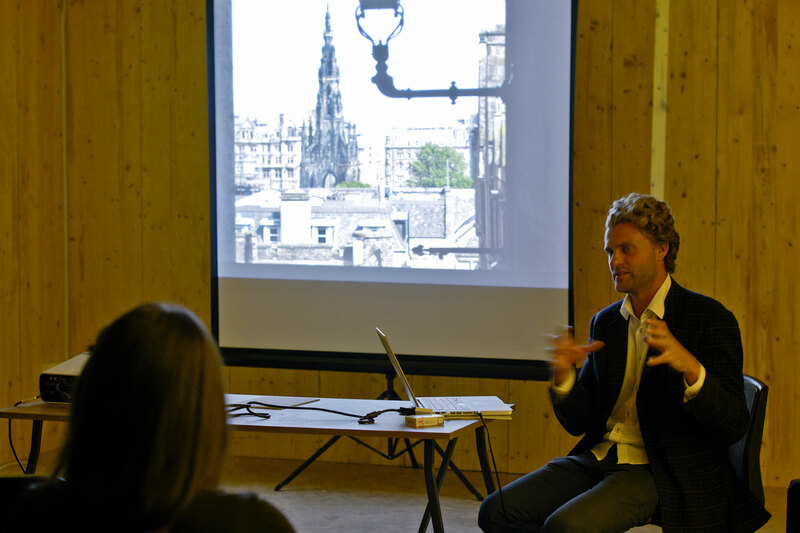 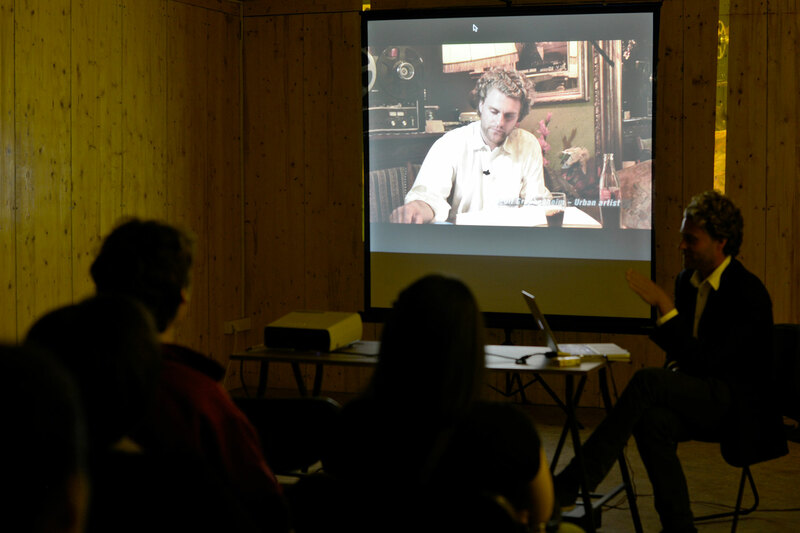 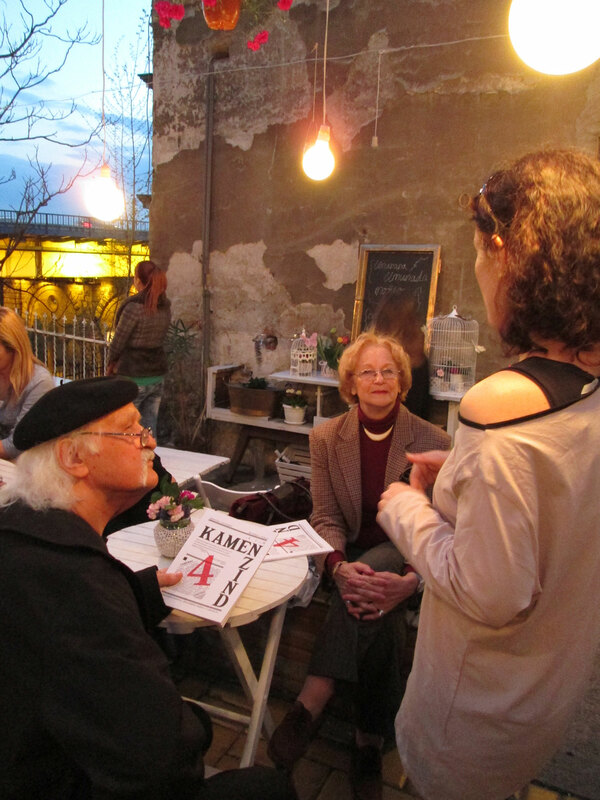 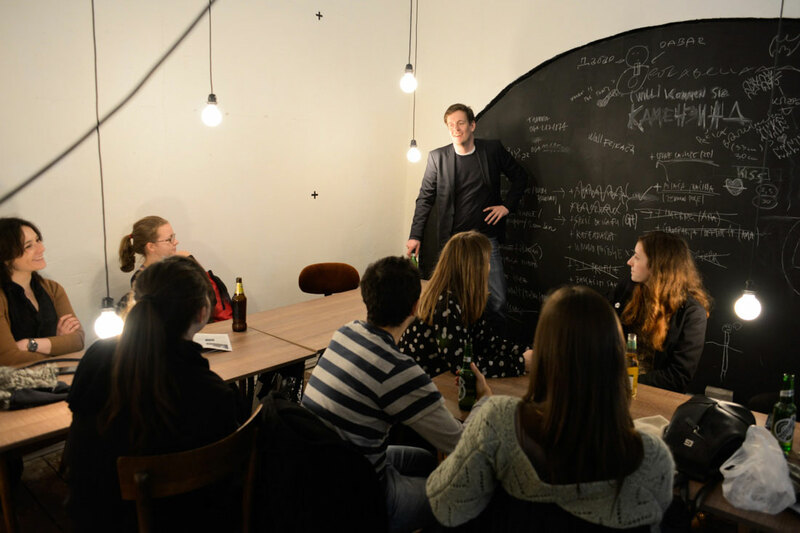 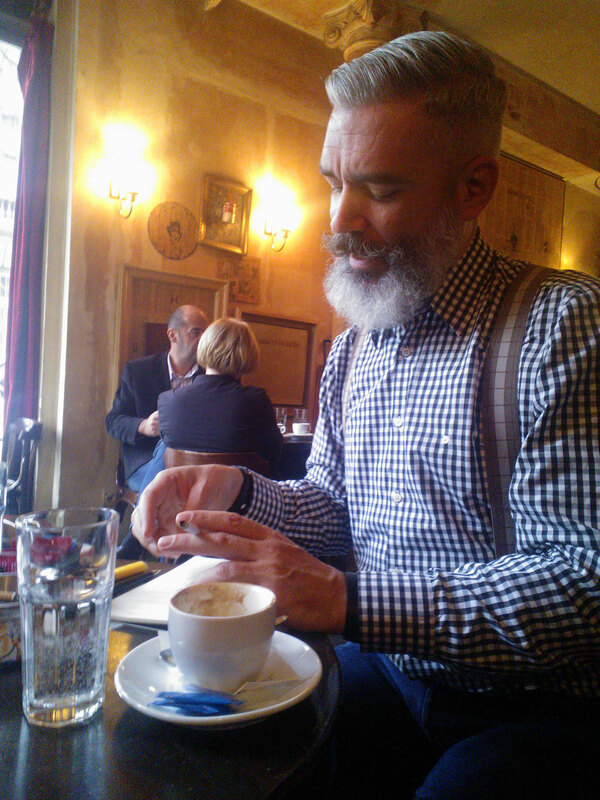 Axel Langer was a writer-in-residence invited by Camenzind Belgrade in November 2013. 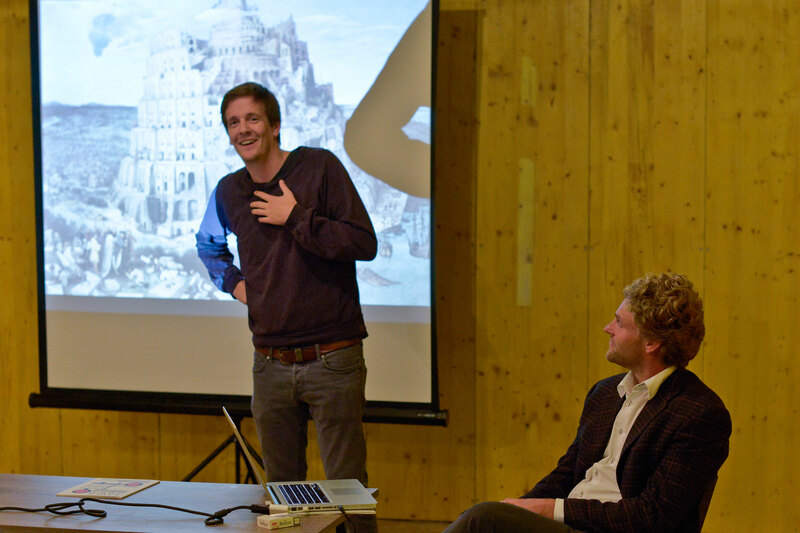 He is a curator for Near-Eastern Islamic Art at the Rietberg Museum in Zurich. 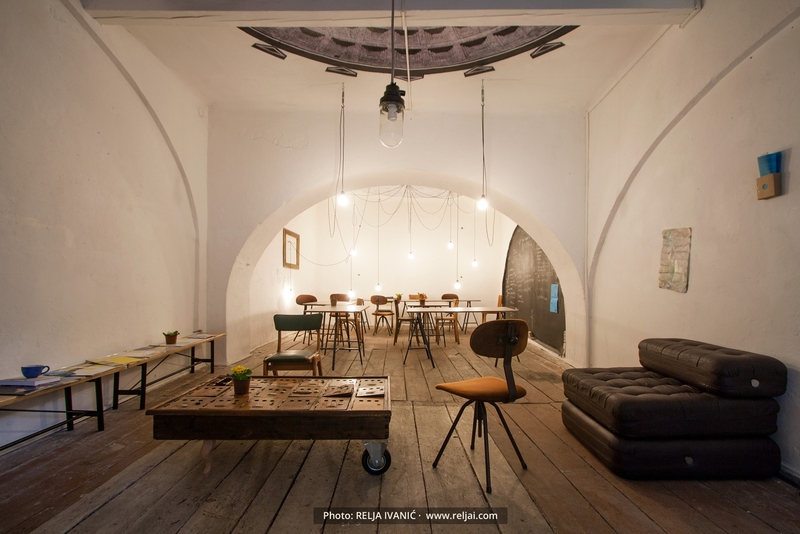 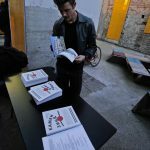 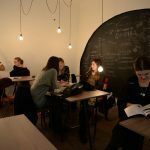 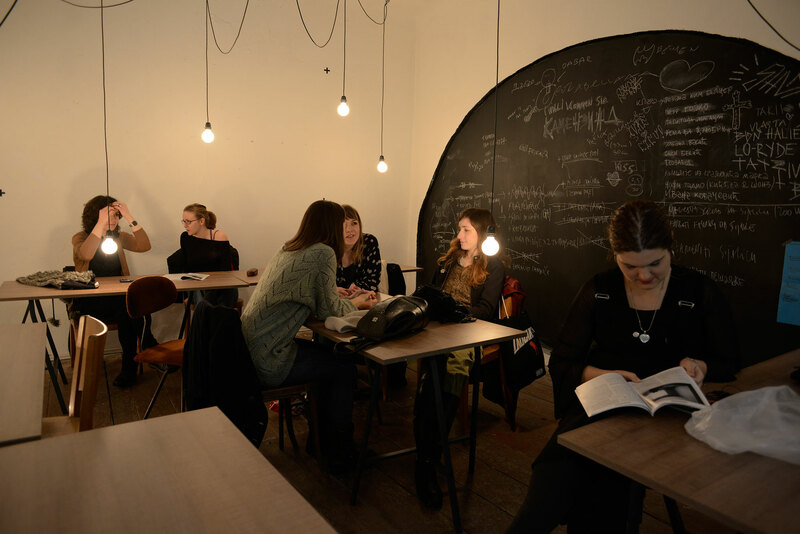 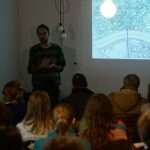 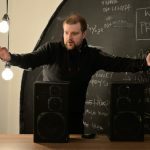 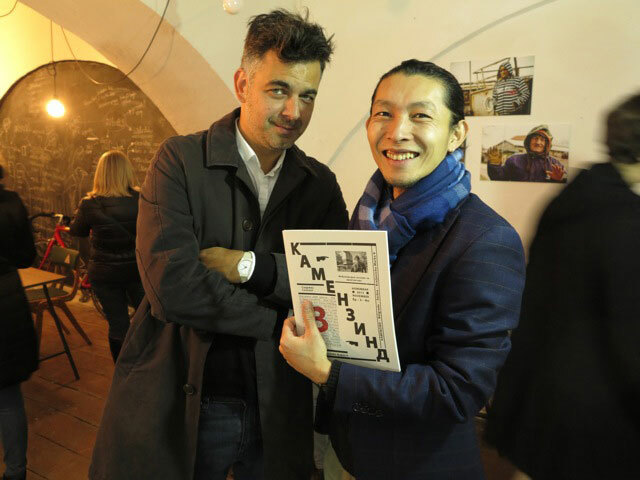 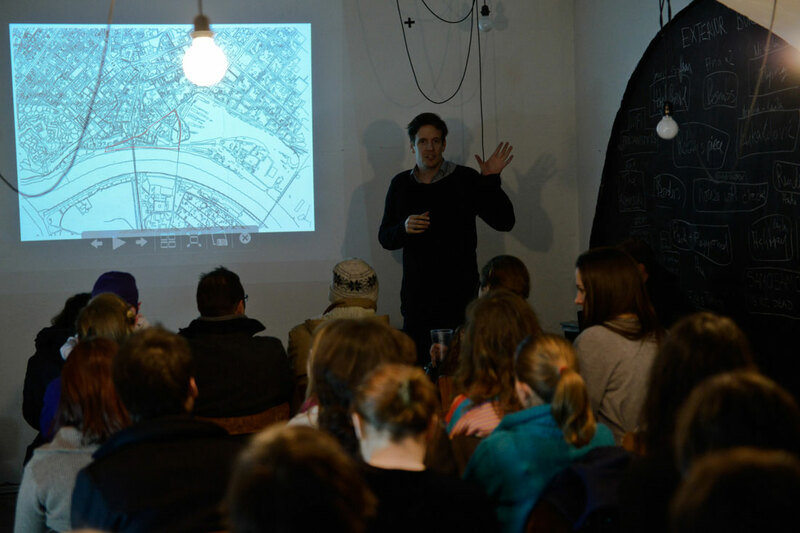 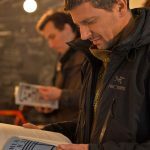 After several interviews with Belgrade based artists, architects and historians in November 2013 Axel wrote an article named “Learning from Belgrade”.